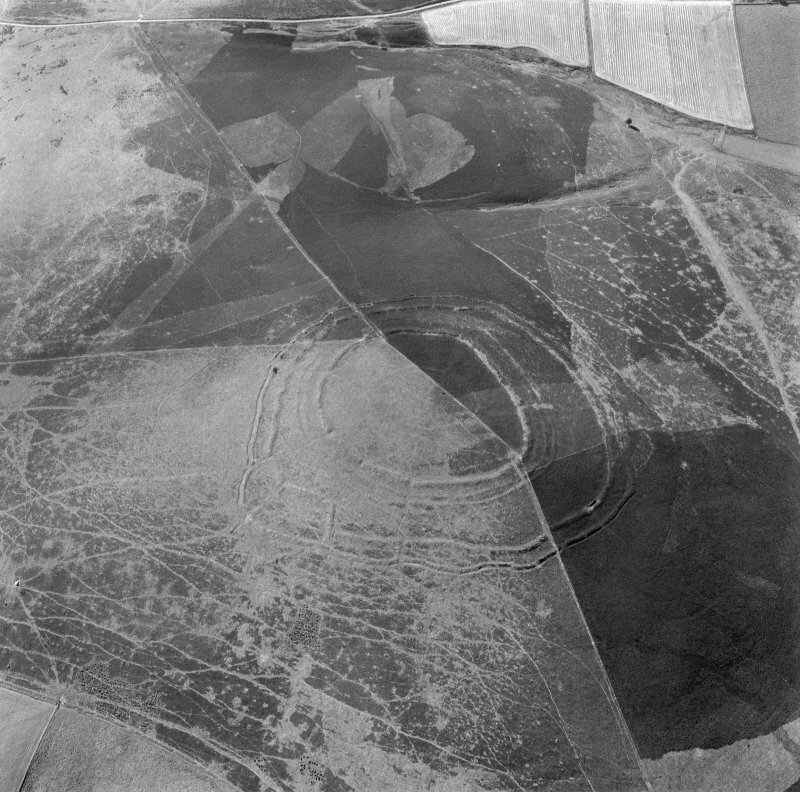 Oblique aerial view centred on the remains of the fort, taken from the SE . 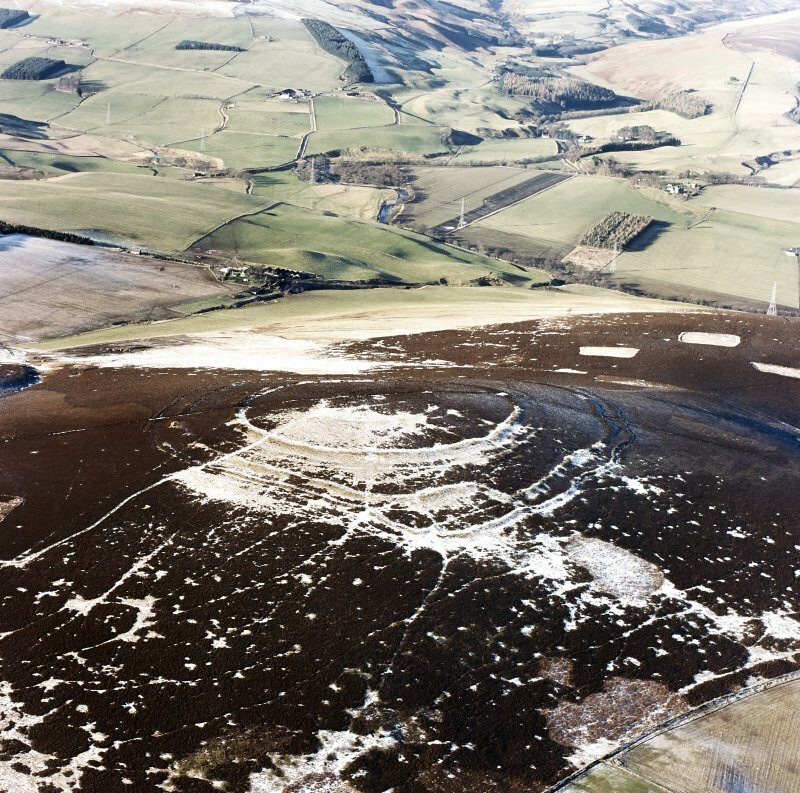 Oblique aerial view centred on the remains of the fort, taken from the SSE . 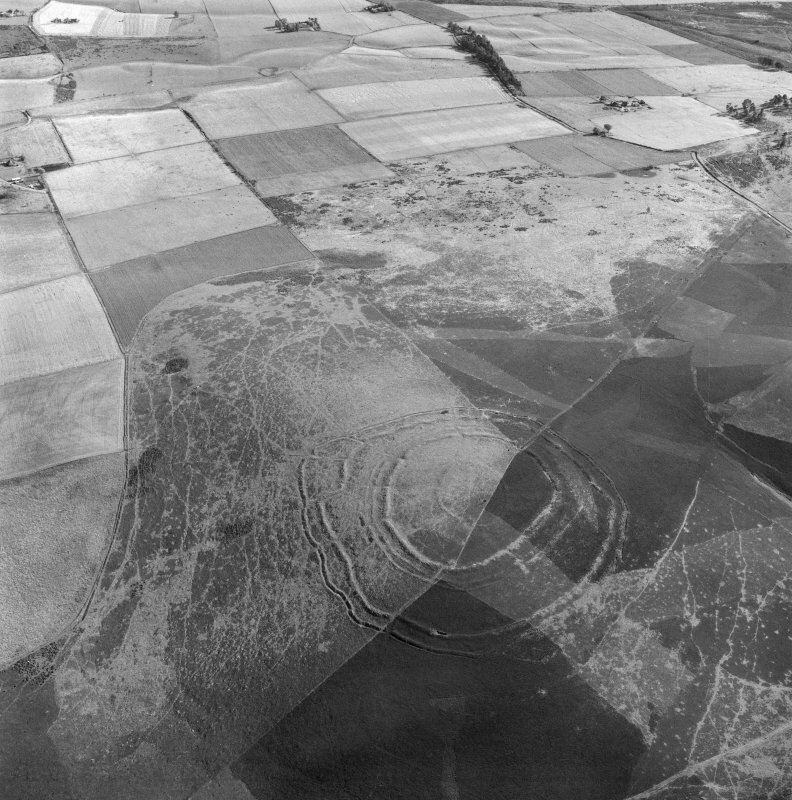 Oblique aerial view of Brown Caterthun centred on the remains of a fort, taken from the ESE. 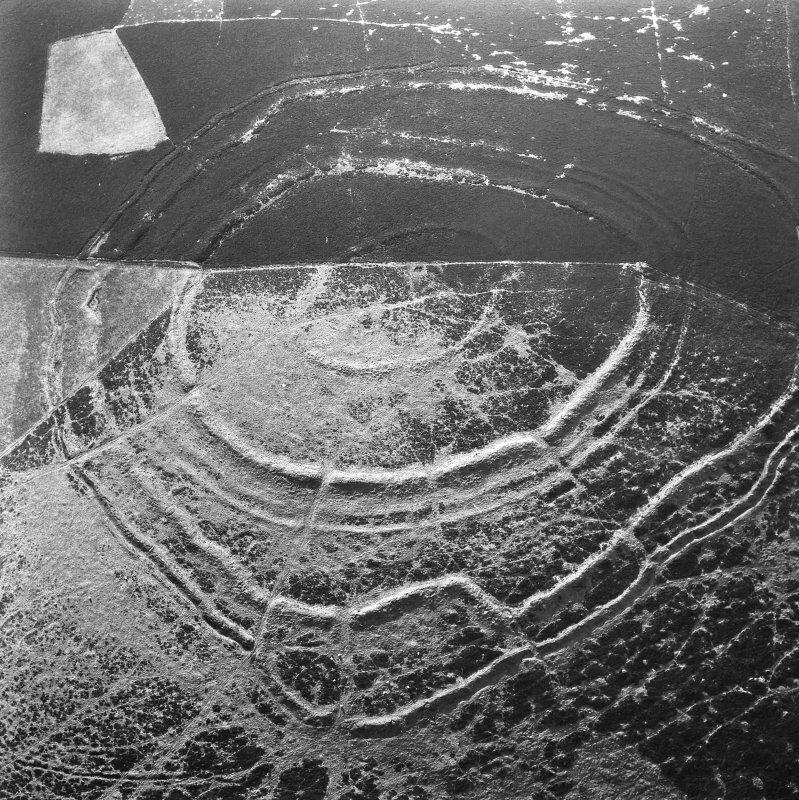 Oblique aerial view centred on the remains of the fort at Brown Caterthun. 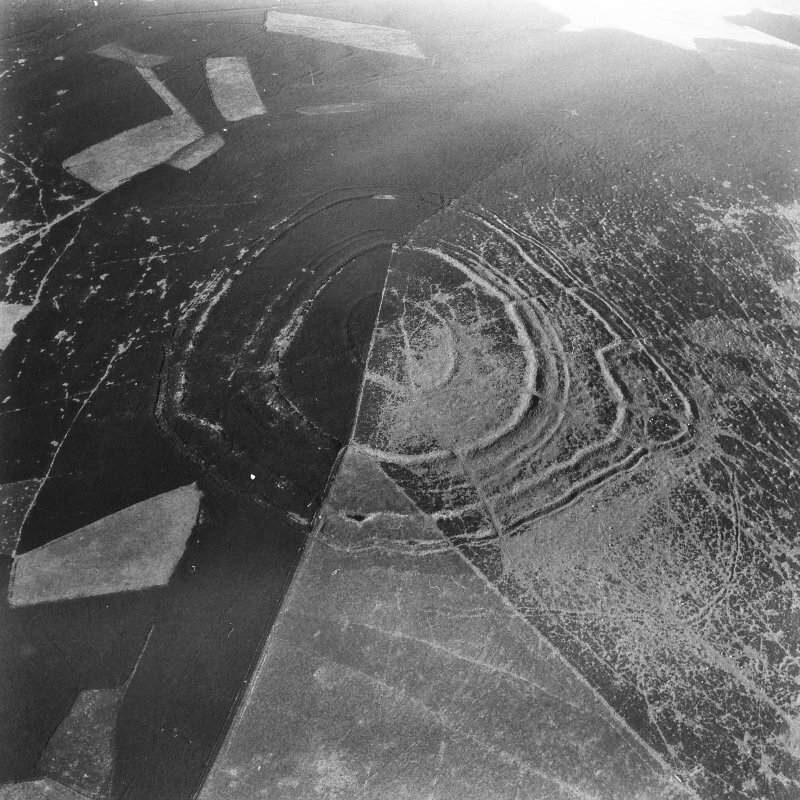 Oblique aerial view centred on the remains of the fort, taken from the SSW. Excavation photographs: Film 68 from the 1996 season at Brown Caterthun. Trench 14: Rampart F and ditch from the east. 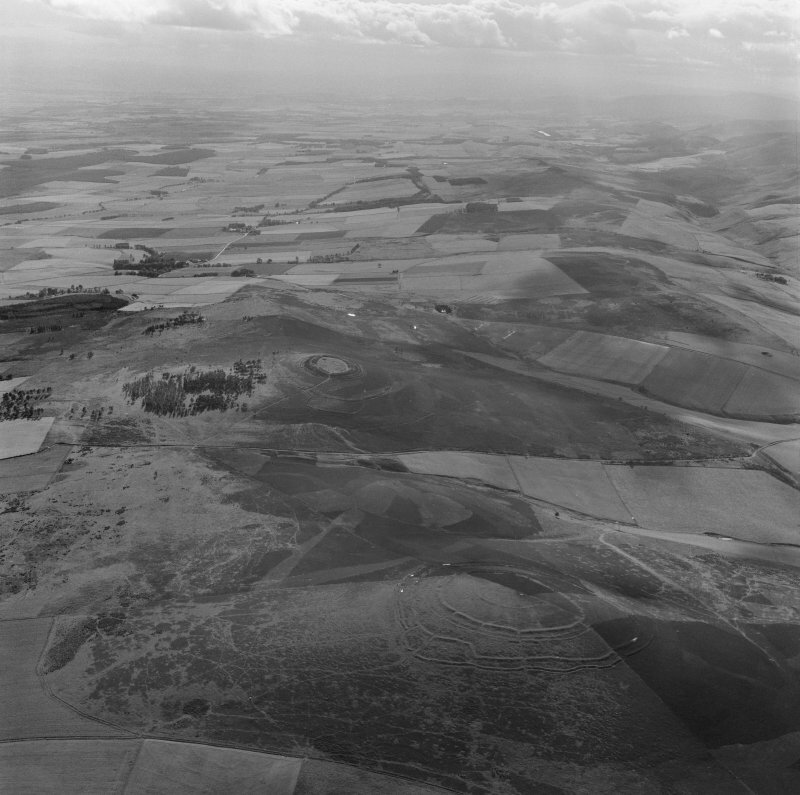 Oblique aerial view centred on the remains of the fort at Brown Caterthun, looking to the NW. 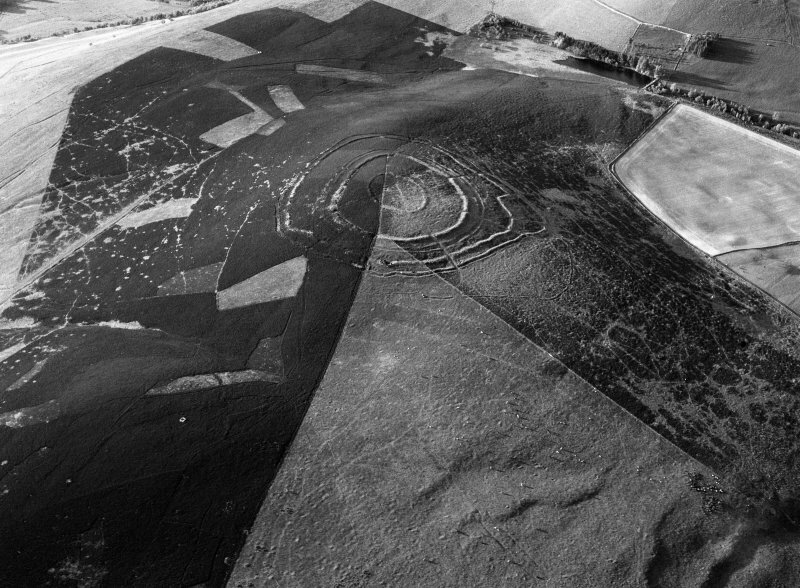 Oblique aerial view centred on the remains of the fort at Brown Caterthun, looking to the WNW. Excavation photographs: Film 66 from the 1996 season at Brown Caterthun. Wall B rear face, Trench 17. 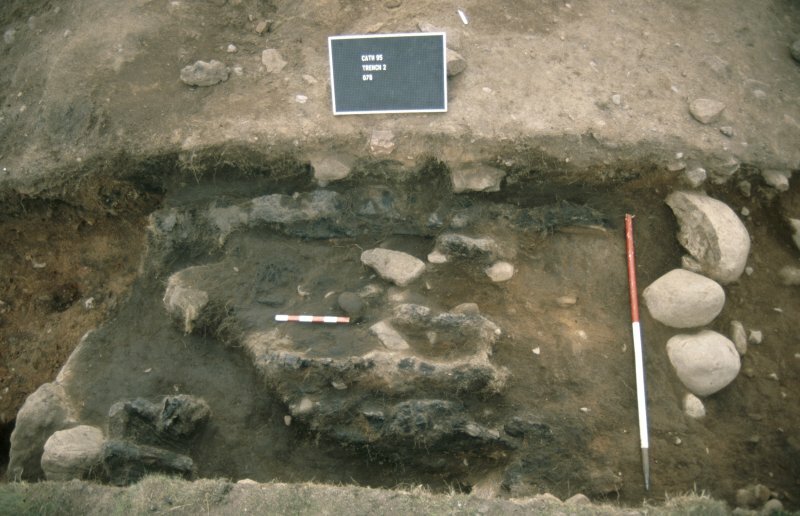 Excavation photographs: outer-most rampart of the multivallate fort, Brown Caterthun. 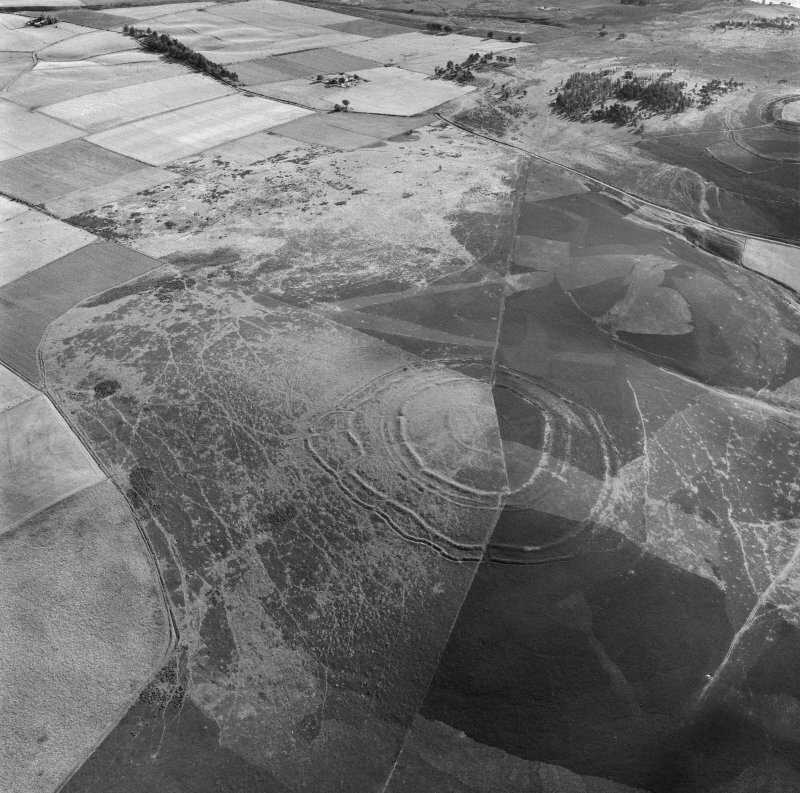 Oblique aerial view centred on the remains of the fort at Brown Caterthun, looking to the NNW. 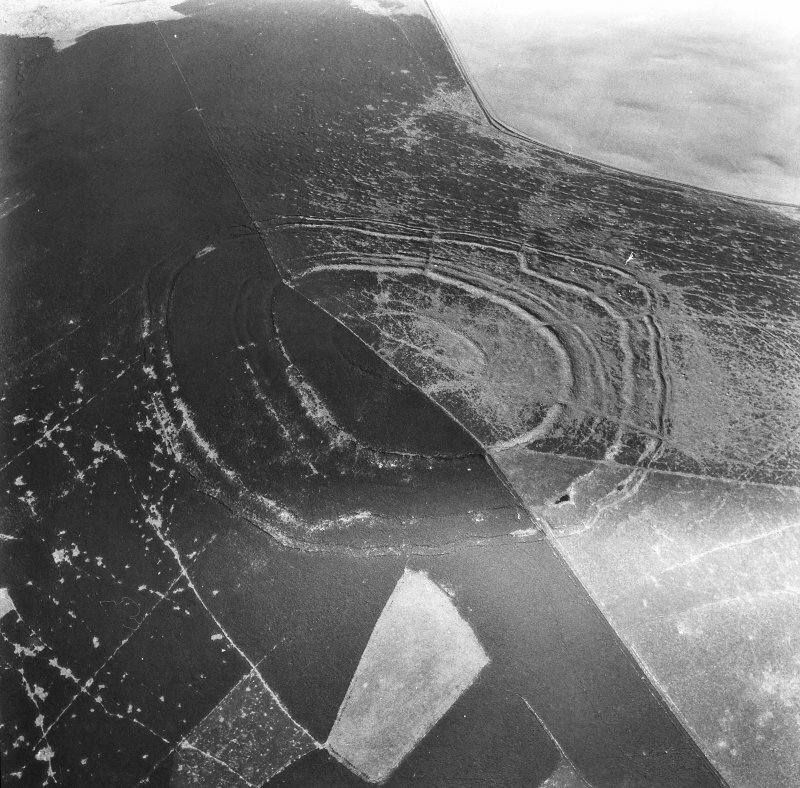 Oblique aerial view centred on the remains of the fort, taken from the ESE . 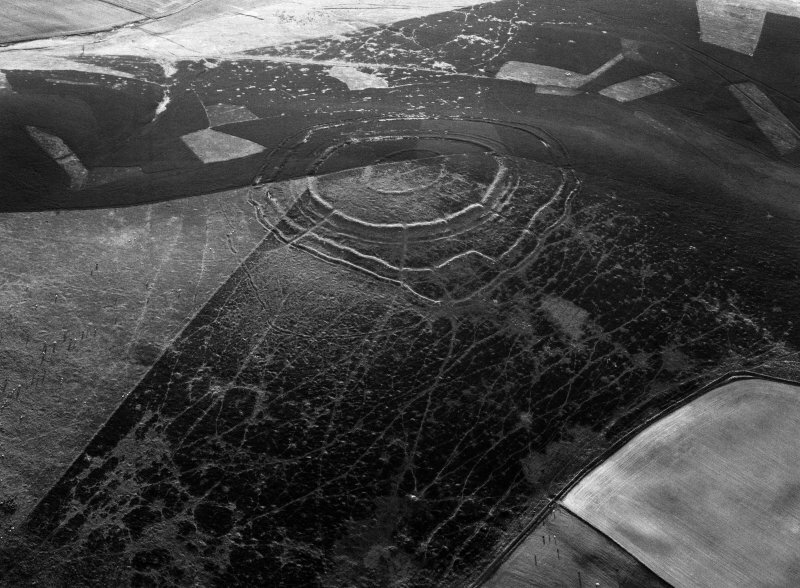 Oblique aerial view of Brown Caterthun centred on the remains of a fort, taken from the NE. 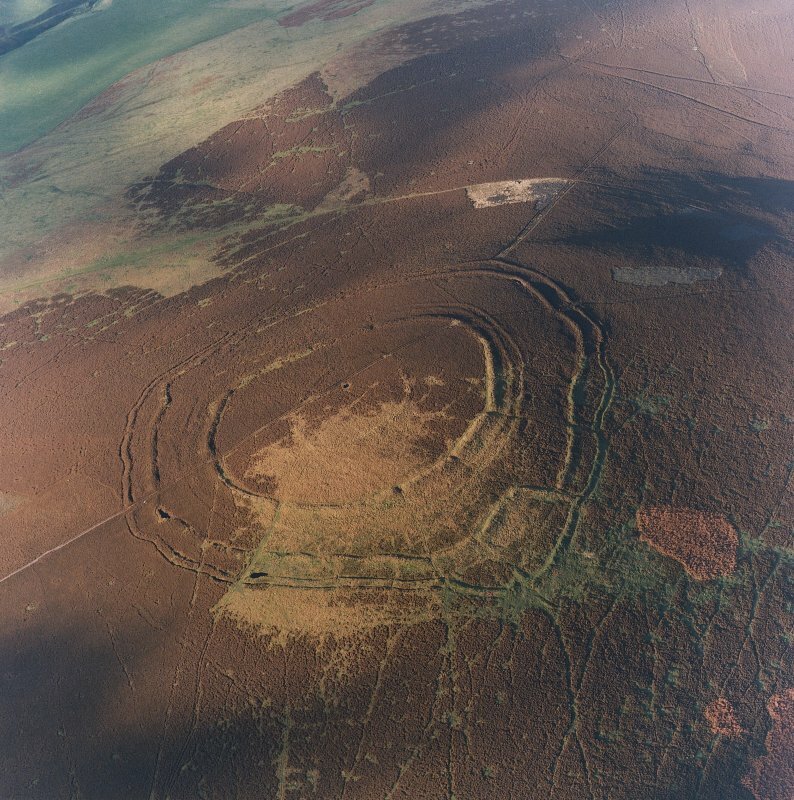 Oblique aerial view centred on the remains of Brown Caterthun fort, looking to the SSW. 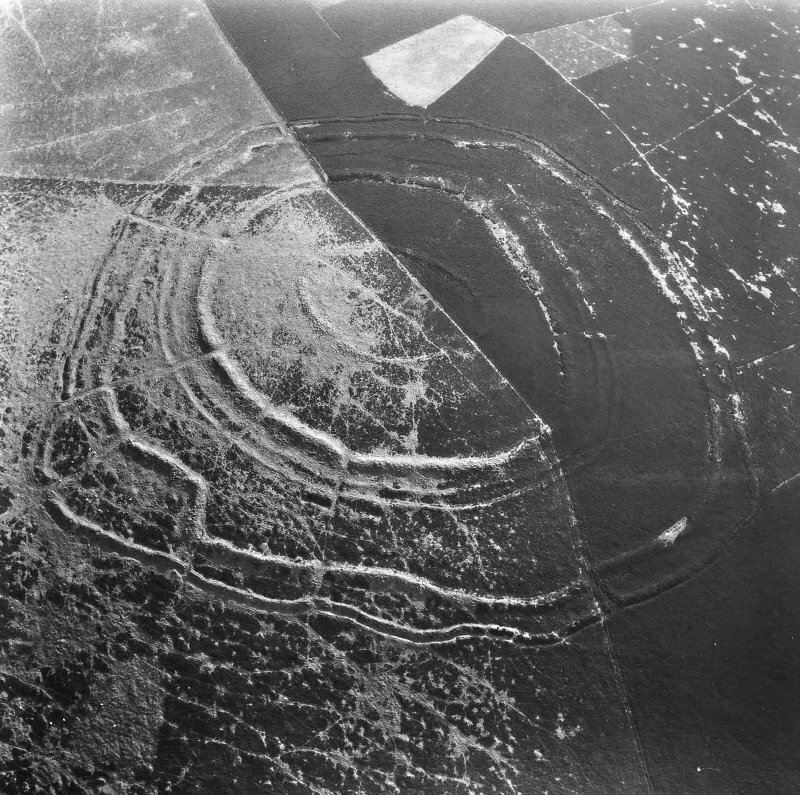 Oblique aerial view of Brown Caterthun centred on the remains of a fort, taken from the ENE. 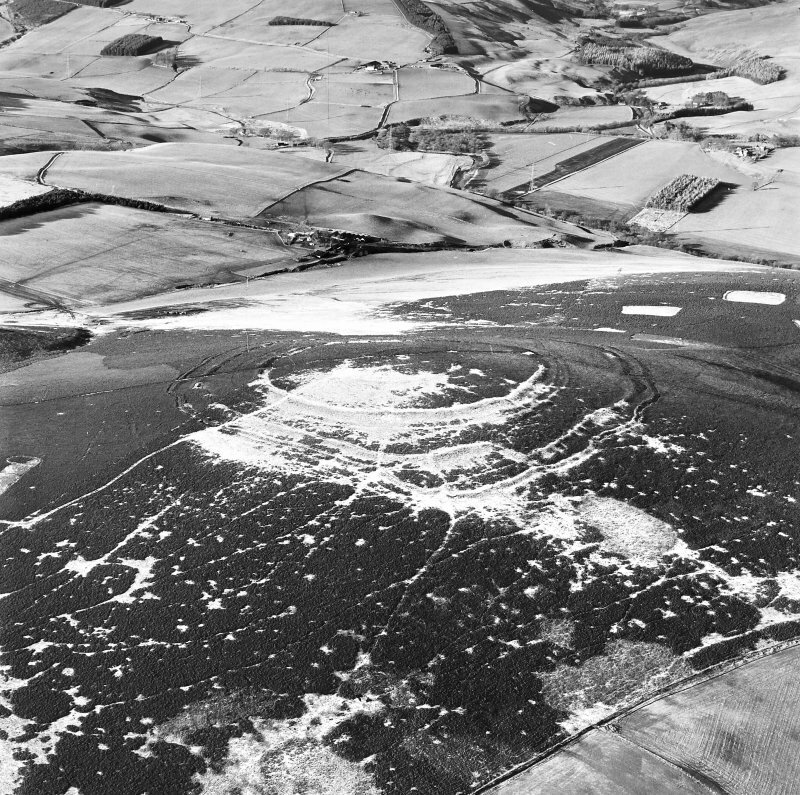 Oblique aerial view centred on the remains of the fort, taken from the S.
Excavation photographs: Film 56 from the 1996 season at Brown Caterthun. Trench 21: quarry scoop from the north-east. Within the scoop, to the left, the soil is shallow over bedrock; to the right, outside the scoop, the greater depth of soil can be seen in the stepped section. The irregular gully proved to be a natural feature. 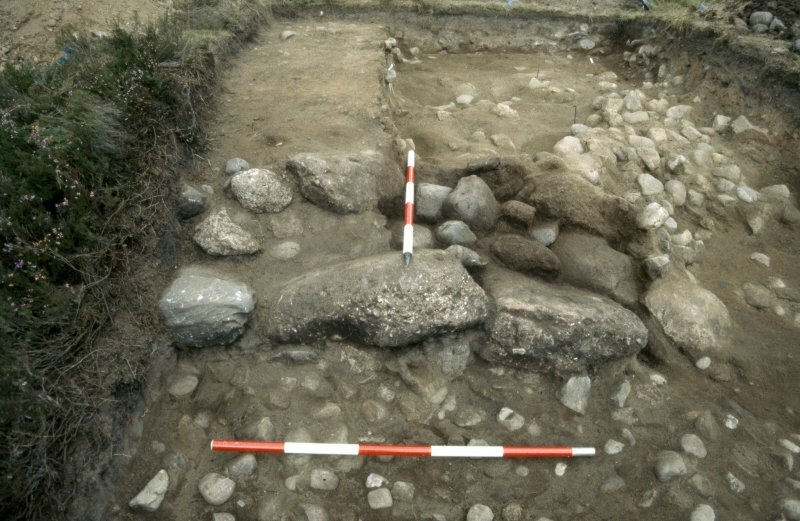 Excavation photographs: entrance of the multivallate fort, Brown Caterthun. 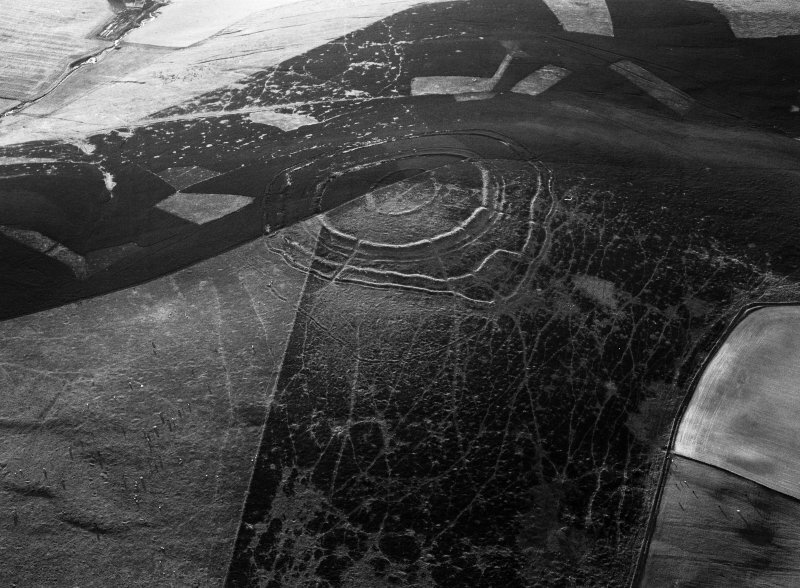 Oblique aerial view centred on the remains of the fort at Brown Caterthun, looking to the NNE. Excavation photographs: Film 23 from the 1995 season at Brown Caterthun. A length of heavily disturbed and disfigured Rampart F (where Trench 1 was excavated), from the north-east. 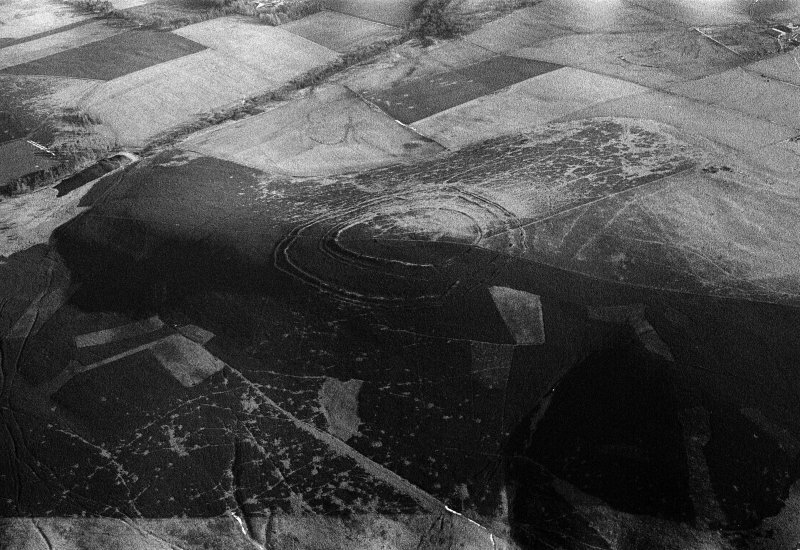 Oblique aerial view centred on the remains of the fort at Brown Caterthun, looking to the N.
Excavation photographs: Film 72 from the 1996 season at Brown Caterthun. Trench 12, Rampart F: ditch terminal south of hte entrance, showing large rock-cut posthole in terminal, from the north. Excavation photographs: Film 91 from the 1996 season at Brown Caterthun. Trench 15, Rampart E: stone face of rampart and cobble alignment beneath rampart, from the south. 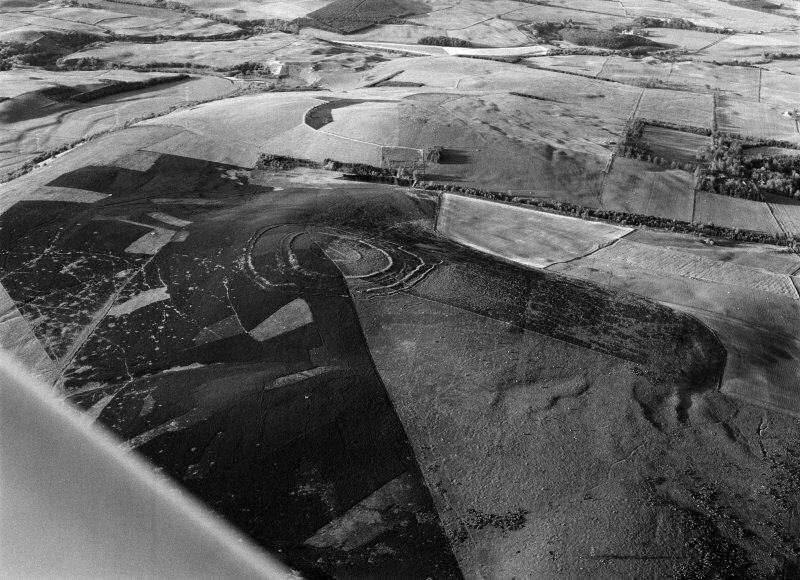 Oblique aerial view centred on the remains of the fort at Brown Caterthun, looking to the W.
Oblique aerial view centred on the remains of the fort, taken from the NE. Excavation photographs: Film 62 from the 1996 season at Brown Caterthun. Trench 20, Enclosure A: entrance within palisade enclosure, from the south. 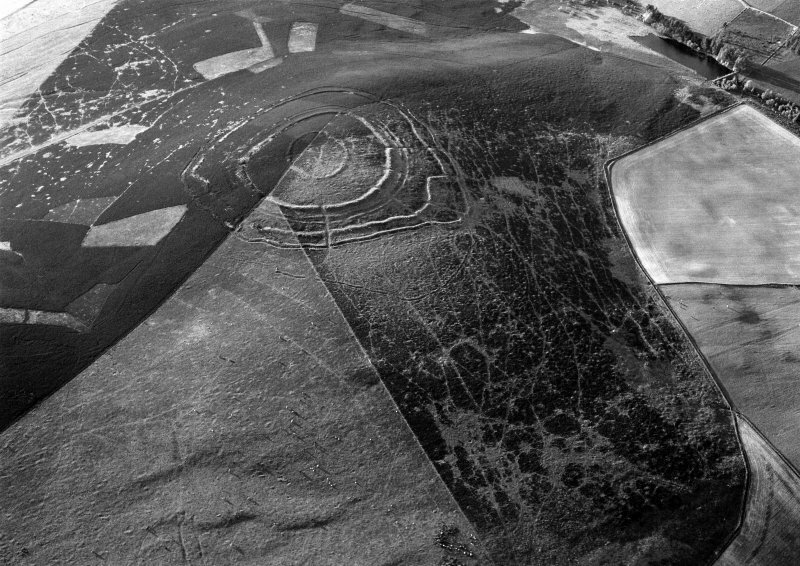 Oblique aerial view centred on the remains of the fort at Brown Caterthun, looking to the ENE. Excavation photographs: Film 68 from the 1996 season at Brown Caterthun. Trench 14: Rampart F, cobble layer, buried turf and posthole from the north-west. Excavation photographs: Film 21 from the 1995 season at Brown Caterthun. Trench 2, Rampart E: burnt timber deposit 6 from the north-east (outer rampart face to left). Note the rabbit burrow running obliquely through the timbers to the left of the small scale. Excavation photographs: Film 7 from the 1995 season at Brown Caterthun. Wall B front face, Trench 5. 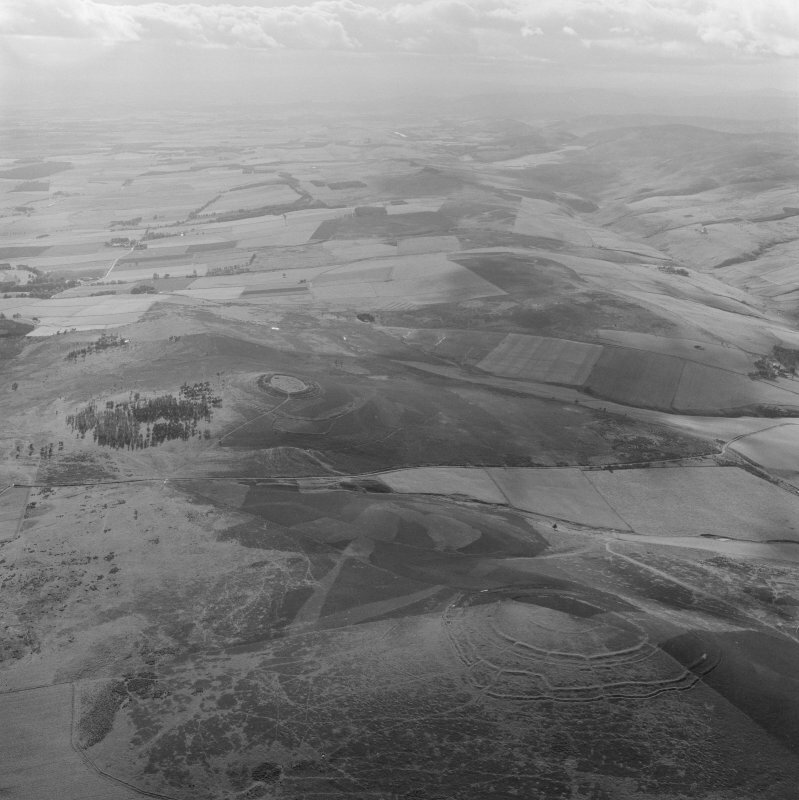 Oblique aerial view centred on the remains of Brown Caterthun fort, looking to the NNE. 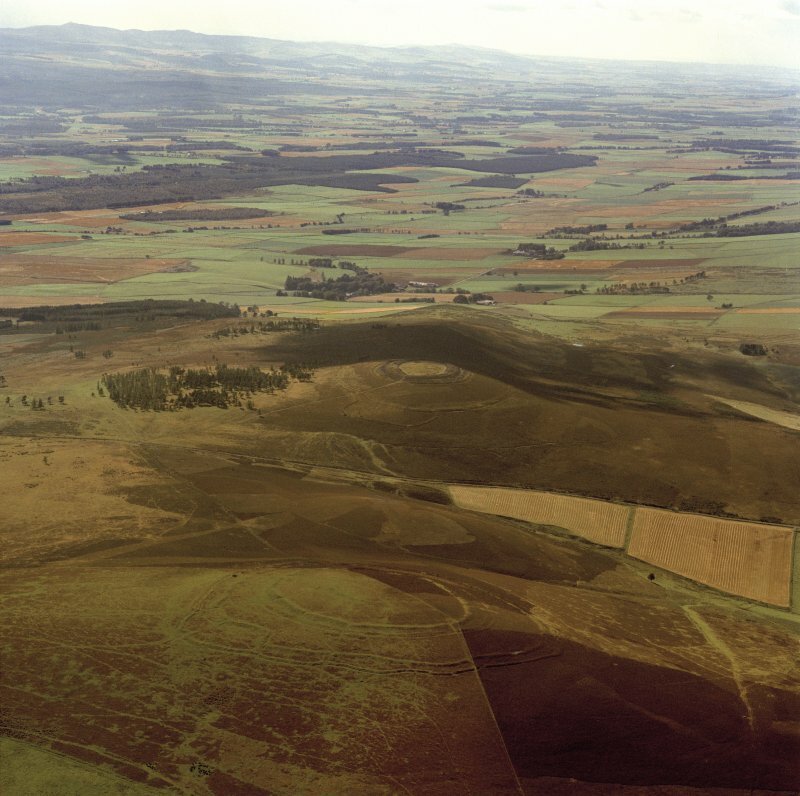 Brown Caterthun, a multi-vallate and probably multi-period hill-fort, unique in that although some smaller and less complex structures in southern Aberdeenshire show comparable features, no close parallel is known. 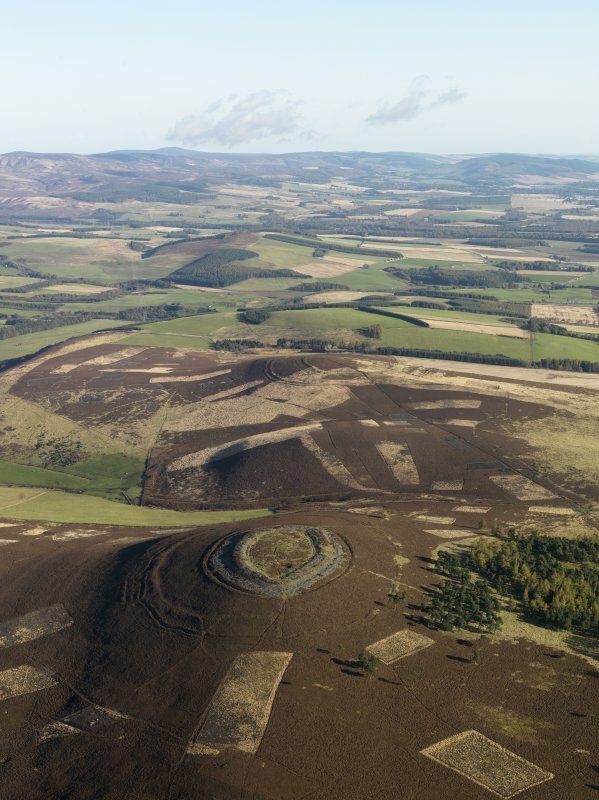 Six lines of defence surround the flat summit of a gently rising hill, the innermost being a ruinous stone wall 3.5m broad and 0.3m in maximum height, enclosing an area 79m by 61m, with a single entrance in the north. Outside this, at distances ranging from 18m to 55m, runs a heavy rampart which may have originated as a wall, and which is now spread to a breadth of about 7.6m. Several stretches of large boulders occur along its outer face, and it has nine entrances. Two ramparts with a median ditch, 6.0m wide and 0.5m deep, closely surround this wall and are probably contemporary with it. They also have nine entrances. Outside these runs a rampart with no apparent ditch, which has a pronounced and unaccountable kink in the east. 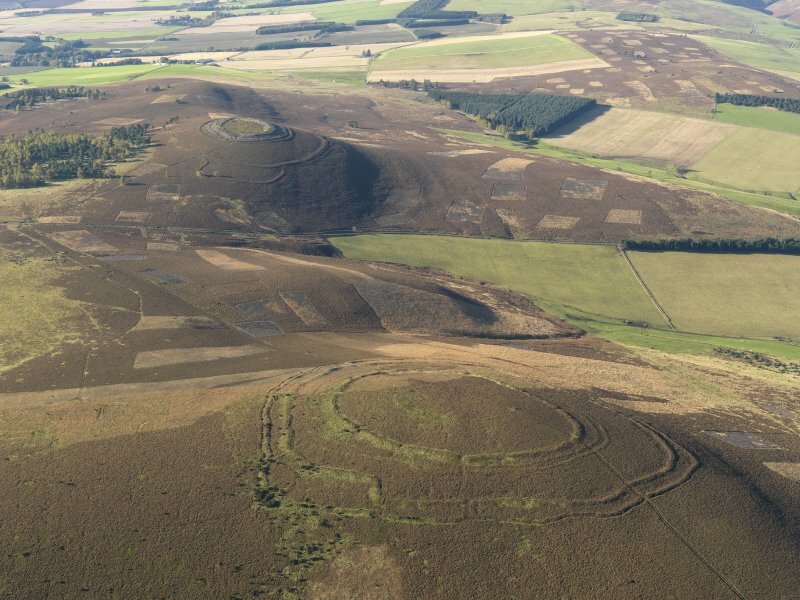 This has eight entrances, as has the outermost line of defence - a rampart with a narrow, 0.5m deep, external quarry ditch - which more or less parallels the line of the former and encloses an area about 305m by 274m. 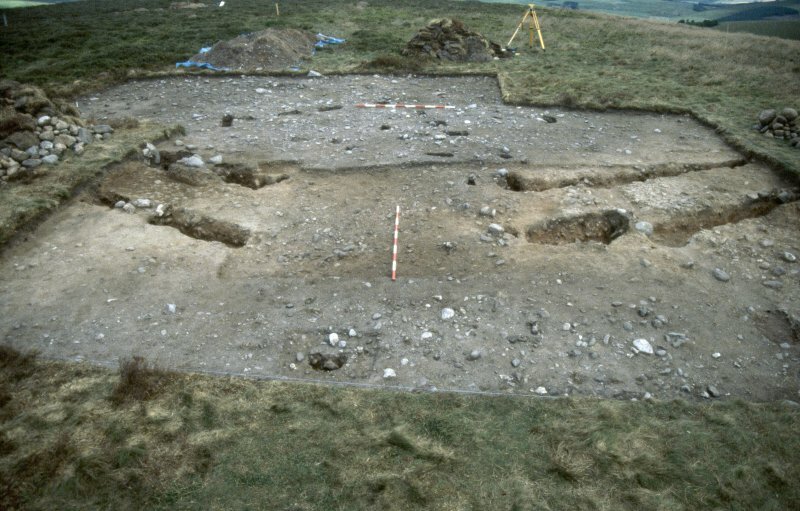 With no real evidence to go on it is almost impossible to interpret the structural phases of this site but there may be at least three, with the innermost enclosure being the last. It may be that not all the gaps are entrances and Feachem states the possibility that they may result from incomplete construction by sections. 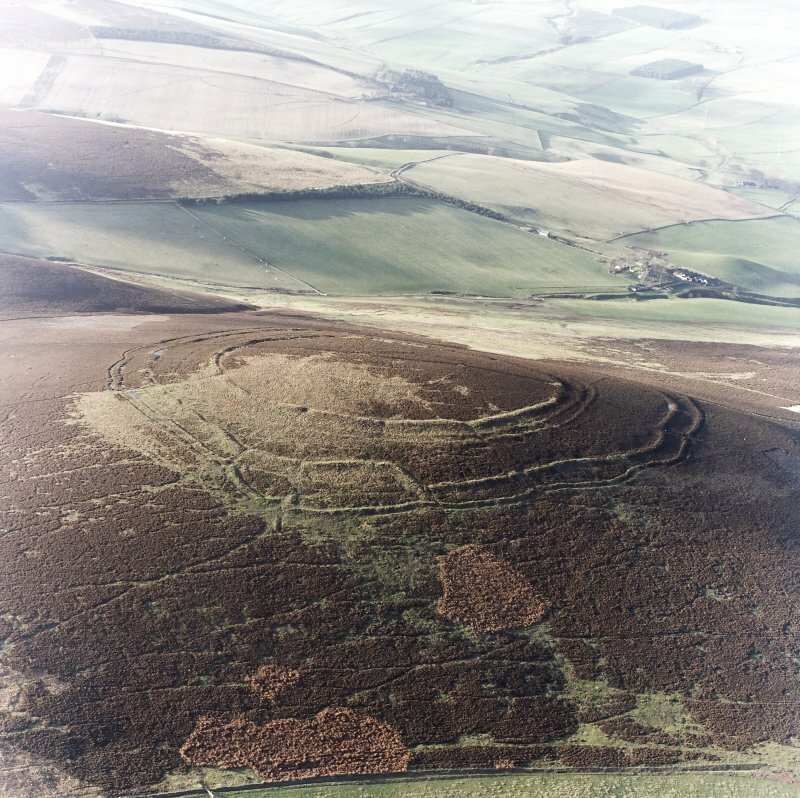 Though the fort is always referred to as "Brown Caterthun" this name actually applies to the hill (Name Book 1858), although its derivation includes 'cathair', a circular stone fort. The meaning of the '-thun' part is not known. R W Feachem 1963; 1966; A J Warden 1885; W J Watson 1926; J K St Joseph 1974; D Christison 1900. Visited by OS(JLD) 16 July 1958. Detached lengths of slight banking and ditching outside the principal suite of defences may correspond to an unfinished scheme to encompass parts of the SE shoulder of the hill within the fortified zone. This most unusual fort occupies the summit of the Brown Caterthun. There are five lines of defence which can be divided into three groups, probably representing at least three phases of construction. 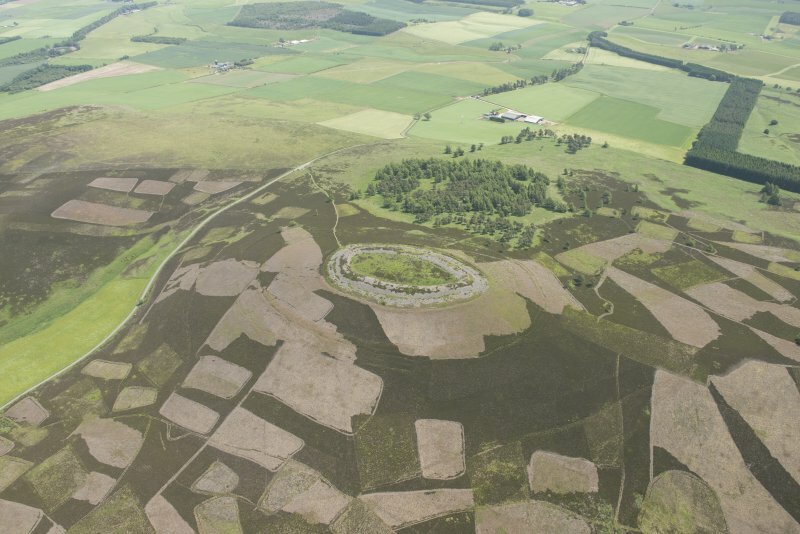 The innermost line is a stone-walled enclosure which measures 91m by 61m internally. The intermediate group comprises a stone wall flanked by double ramparts and a medial ditch; both these lines have eight entrances. 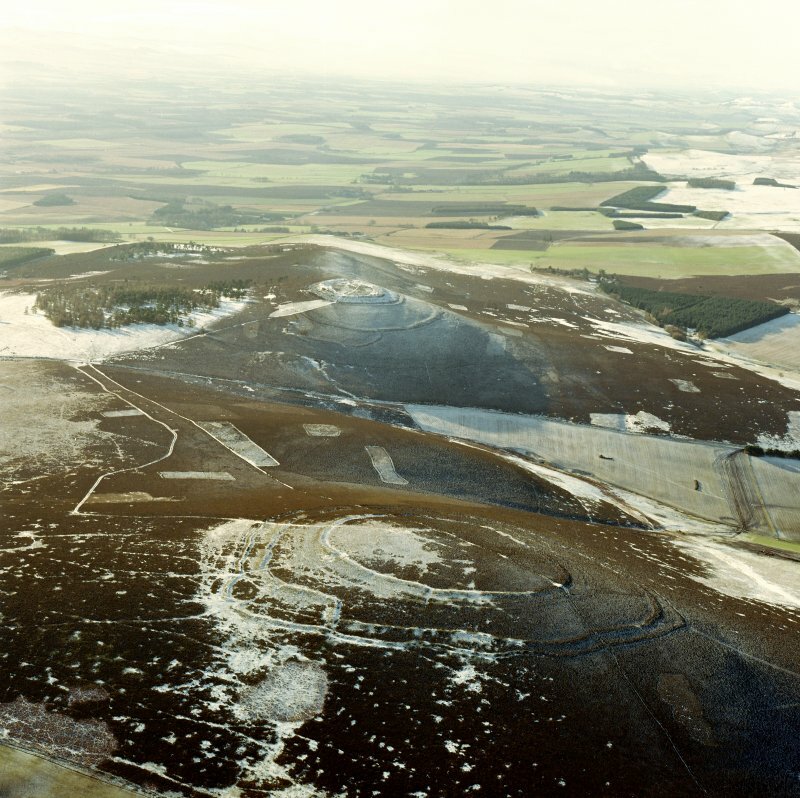 The outer group, which measures a maximum of 330m by 310m over all, consisits of two ramparts of which the outermost is accompanied by a ditch. 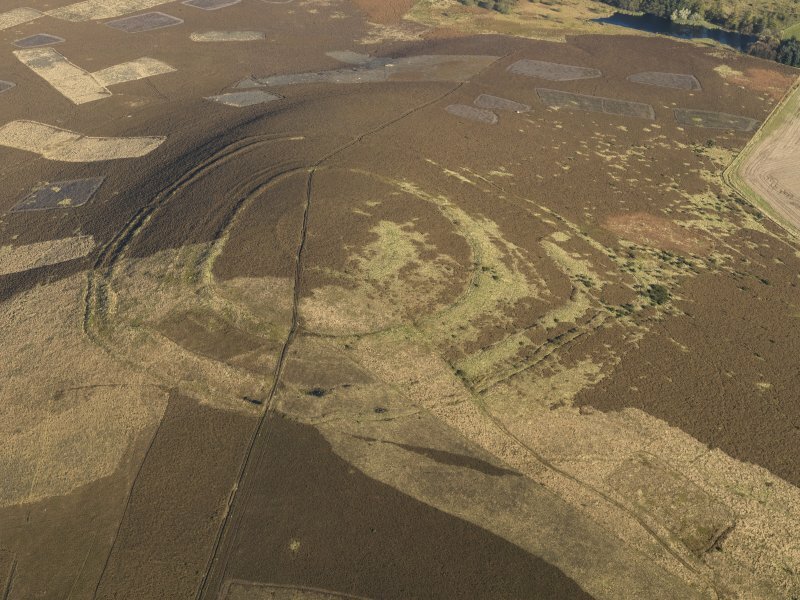 For the majority of the circuit these ramparts are concentric but on the E they diverge to form a roughly rectangular enclosure; like the intermediate line, these ramparts are pierced by eight entrances. 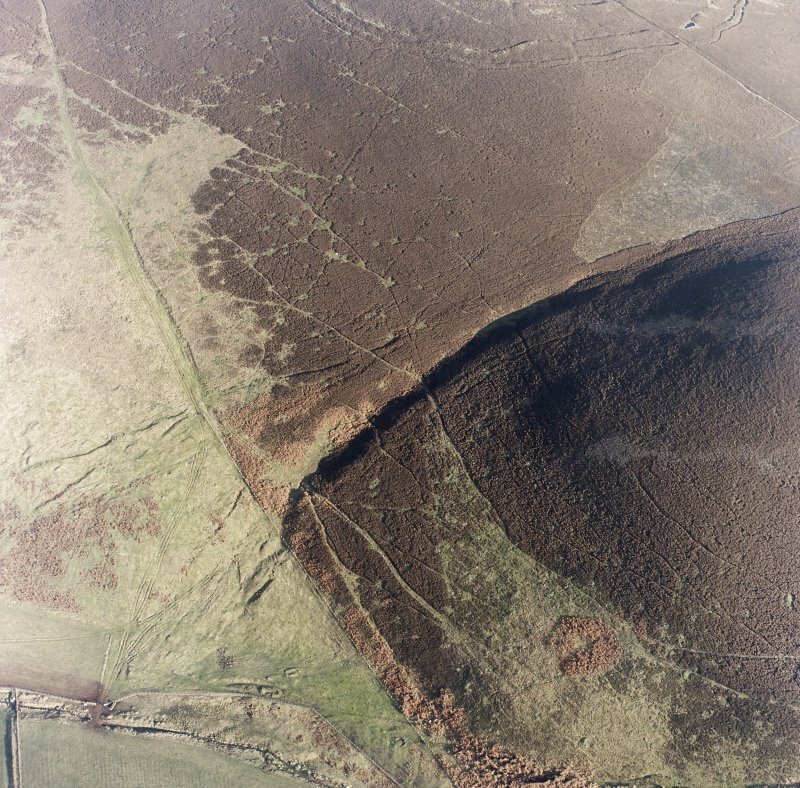 Detached stretches of low banks on the SE shoulder may indicate further defensive works. Excavation of part of the central enclosure in the 19th century revealed only a few post-holes. The fort that crowns the summit of the Brown Caterthun commands impressive views across Strathmore. 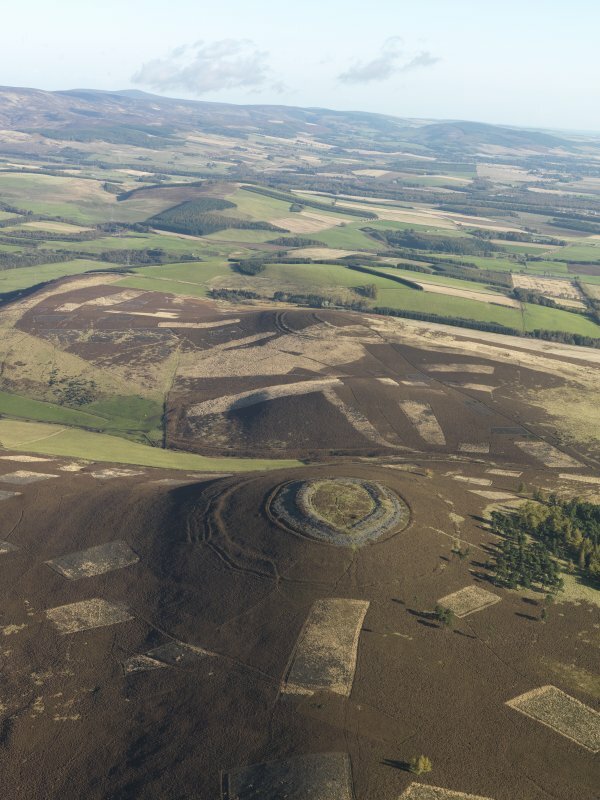 The defences present a remarkable array of earthworks, some slight, others more substantial, and thus can be shown to reflect several periods of construction. 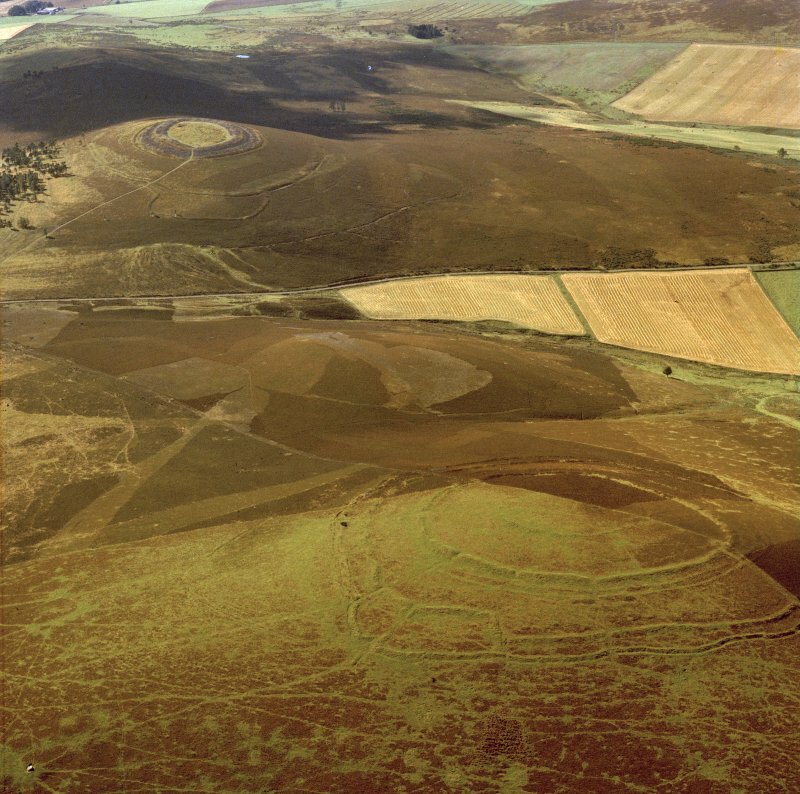 The order in which all seven lines of earthworks were constructed, however, cannot be demonstrated without excavation, and for the purposes of this description they are lettered from the innermost outwards (A-G). The innermost (A) is defined by little more than a shallow groove defining the N side of an enclosure measuring about 30m in diameter. 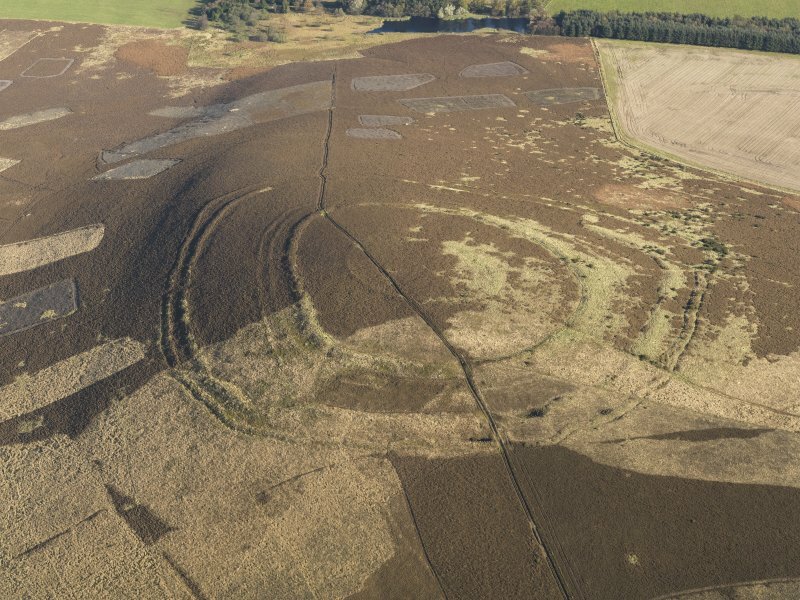 The innermost of the ramparts (B) has been reduced to a low stony bank enclosing an area measuring about 88m from NNW to SSE by 55m transversely. Five gaps are visible in the rampart, but it is not known how many of them are original. Set between 52m and 23m downslope from B there are two concentric lines of defences (C and D) enclosing an area measuring about 192m from N to S by 143m transversely. 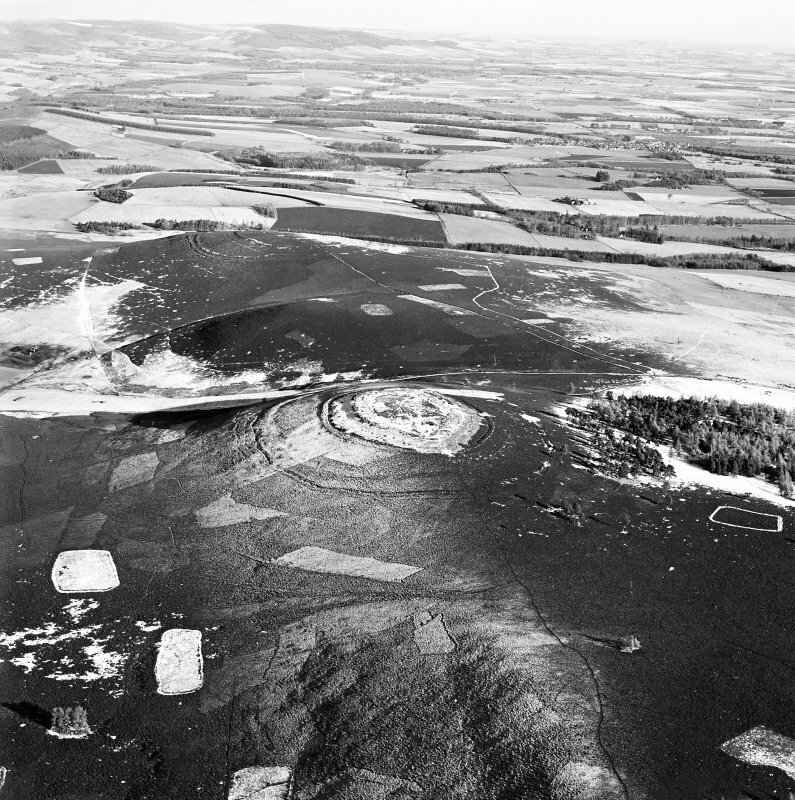 The inner (C) is a substantial rampart which has several lines of outer face visible and a few internal quarry-pits, while the outer (D) comprises twin ramparts reduced to little more than scarps. Nine entrances are visible in rampart C, all of them matched by gaps in the twin ramparts (D) beyond them; the latter, however, have an additional gap at H, which appears to be the remains of an entrance blocked by rampart C. Eccentrically placed between 10m and 43m beyond these ramparts there are two further lines of defence (E and F) which follow roughly parallel courses. 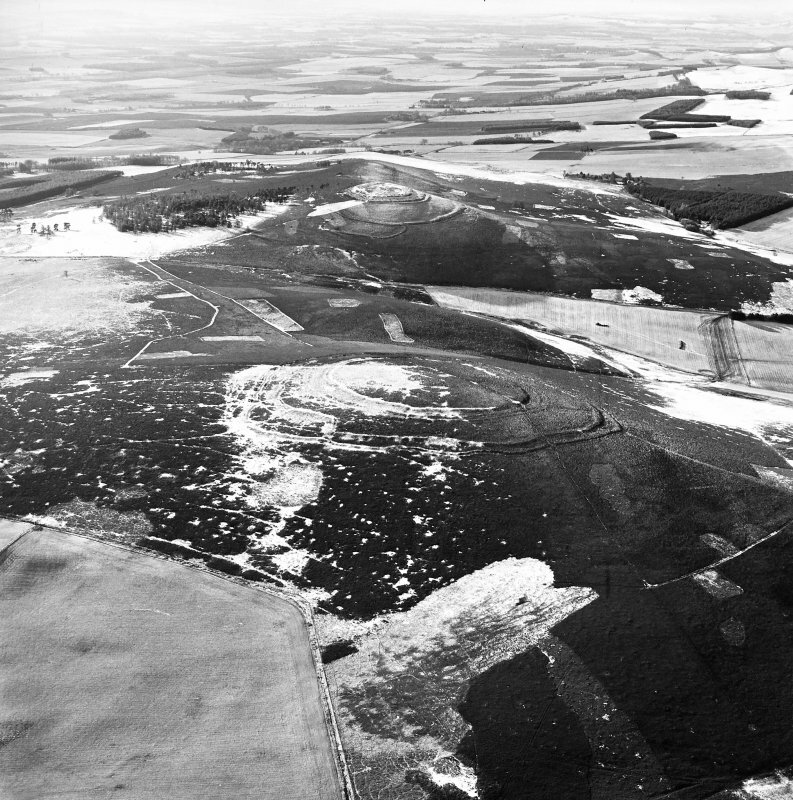 The inner (E) is a thick rampart flanked by shallow internal quarry-pits for its entire circuit; the outer (F), is represented by a rampart with an external ditch and counterscarp bank, it too is intermittently flanked by internal quarry pits. Nine entrances through these defences are visible; most of them have worn hollows dropping down between the rampart terminals and three give the impression of an entrance passage flanked by low banks linking the two lines of defence. 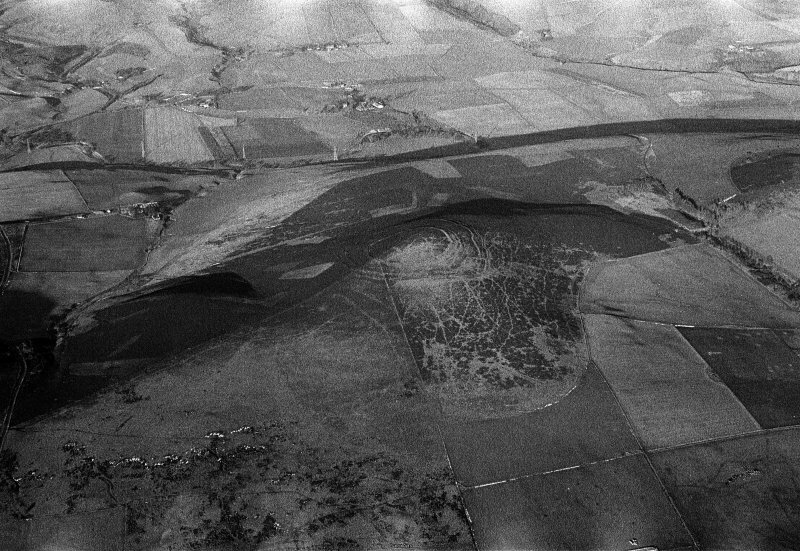 On the SW, at J, one of the quarry-pits behind rampart E appears to cut a hollowed track which drops down from an entrance through ramparts C and D. The seventh line of earthworks (G) contours round the spur to the SE of the fort and, where best preserved, comprises two low banks with a medial ditch. Three separate defensive schemes may be identified within the earthworks, one represented by rampart B, a second by ramparts C and D and a third by ramparts E and F. The evidence visible at J and H, however, only allows the defences of the second and third schemes to be placed in sequence. This evidence indicates that ramparts D were superceded by C, which was followed by the construction of E and F. Nonetheless there is no evidence of any robbing along rampart C, which may well have continued in use after the addition of E and F. These two outer lines of defences were almost certainly constructed at the same time, as can be seen by an examination of the dog-leg in the ramparts on the E side of the fort. The origin of this curious arrangement probably lies in a serious error in the planning and execution of the work. For the most part the outer defences follow the contour, but at K they turn abruptly upslope and cut across the SE spur of the hill; the slight earthwork G apparently continues this line along the contour. Whether G is a marking out earthwork is impossible to determine, but it appears that the builders of E and F took a short cut over the spur to shorten their perimeter, but failed to achieve the correct alignment when they met the ramparts under construction on the E. Both lines of defence make abrupt changes in direction here, but faint scars (L, M and N) possibly derived from marking out or the first stages of construction, continue their lines. The relationship of the innermost rampart (B) and the inner enclosure (A) to the rest of the defences is unknown. 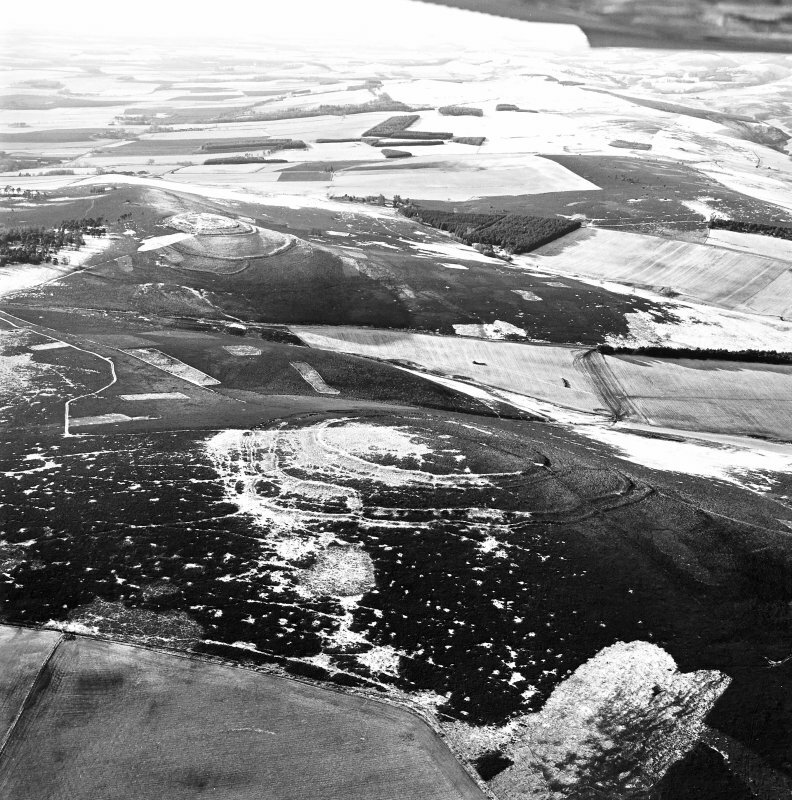 The poor state of preservation of rampart B, however, suggests that it was robbed to provide stone for the comparatively undisturbed rampart C. The remains of the inner enclosure (A) are similar to those identified in the White Caterthun fort (NO56NW 17) and are comparable to the slight earthworks derived from palisaded enclosures in the Border Hills. 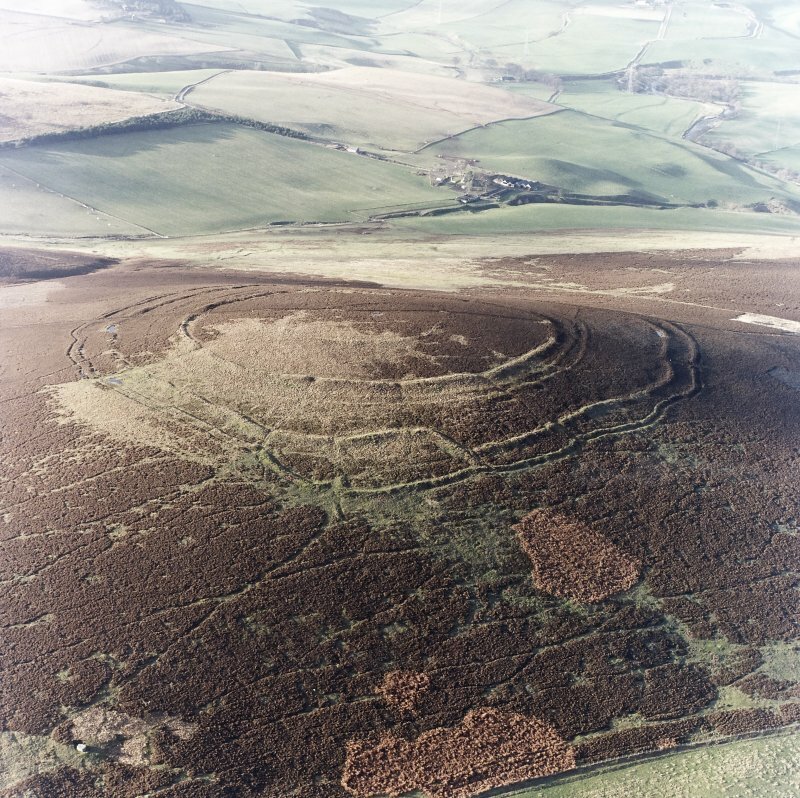 NO 555 668 (NO56NE 1) An archaeological survey and excavation were conducted at Brown Caterthun between August and October 1995 in response to evidence of substantial rabbit damage to the earthworks enclosing the hilltop. 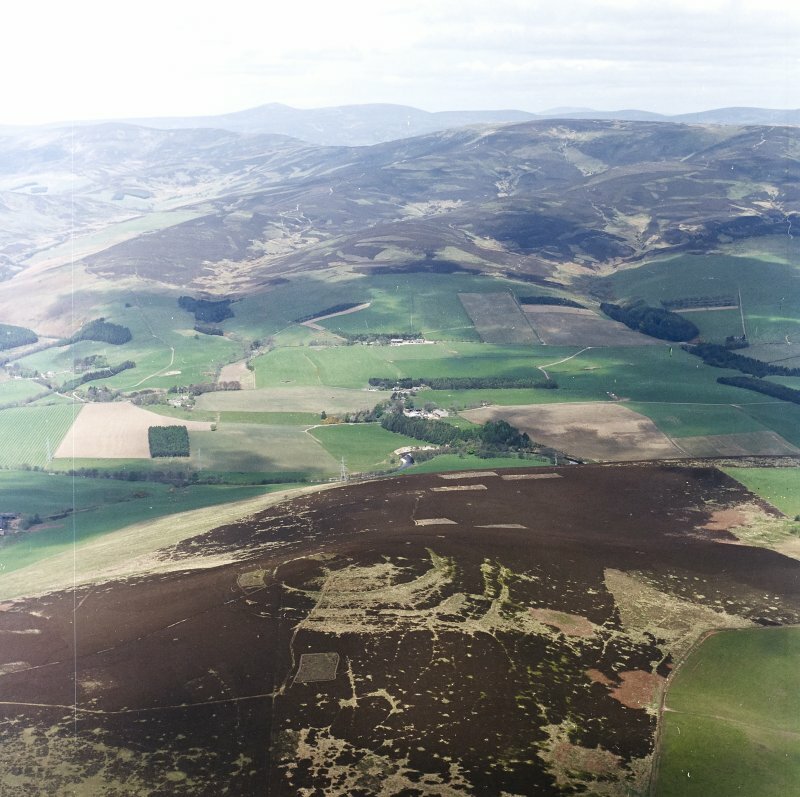 The principal motive for the fieldwork was to assess the extent of rabbit-derived erosion, as a basis for future implementation of ameliorative land management policies. 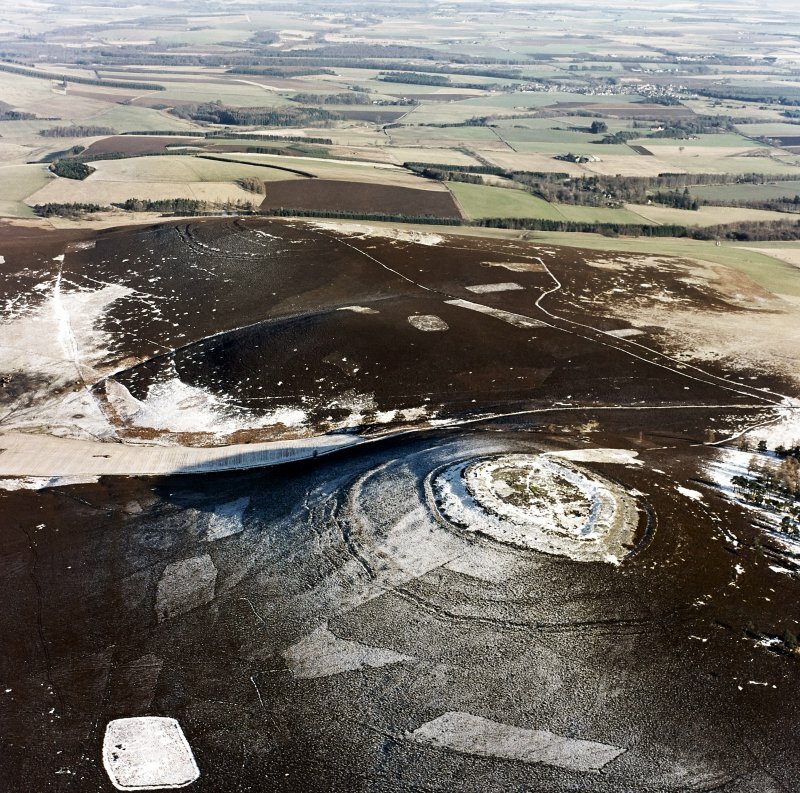 The evaluative excavations have shown that the degree of rabbit (and other) damage to Brown Caterthun hillfort is at least as extensive as surface traces indicate and in many instances the erosion was more severe. A total of eight trenches (Trenches 1-8, Fig 34) with a combined area of c222 sq m, were investigated. Trench 1 revealed the outermost rampart to be c2.9m wide, preserved only up to 0.4m high, and constructed as a simple dump rampart. The inner edge was sealed by cobbling. 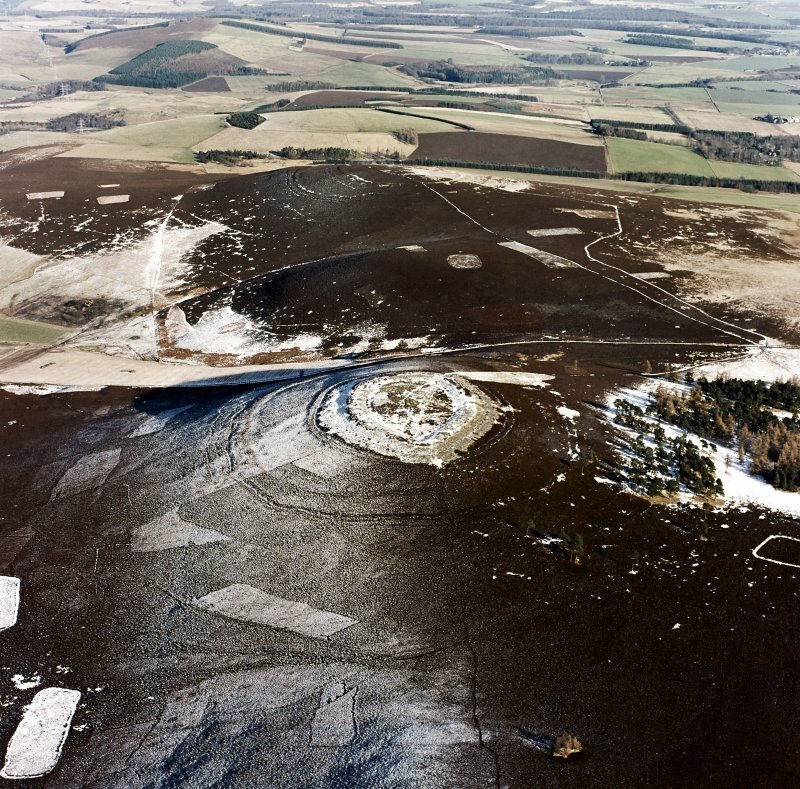 The outer edge of the rampart lay immediately beside a ditch which was revealed to be c2.3m wide, c1.6m deep and was rock-cut through bedded strata of soft red sandstone and conglomerates. The ditch was broadly V-shaped. A counterscarp bank lay c0.8m beyond the ditch. A decayed turf layer was sealed directly beneath the rampart. Trench 2 exposed a rampart c4m wide and up to 0.8m high, of relatively complex construction. It consisted of a foundation of laid turfs, partially defined by two lines of boulders, upon which a raft of burnt timbers had been laid. 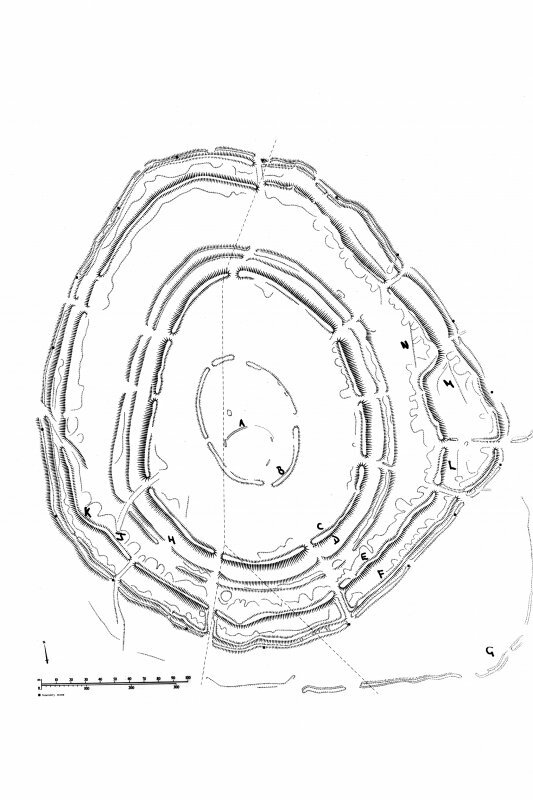 The raft comprised a series of closely-spaced transversal timbers, and a longitudinal timber just within the outer boulder alignment, perhaps laid to consolidate the turf base and to provide a solid foundation for the upper parts of the rampart. The turf base was heavily scorched, suggesting that the timbers had burnt in situ. 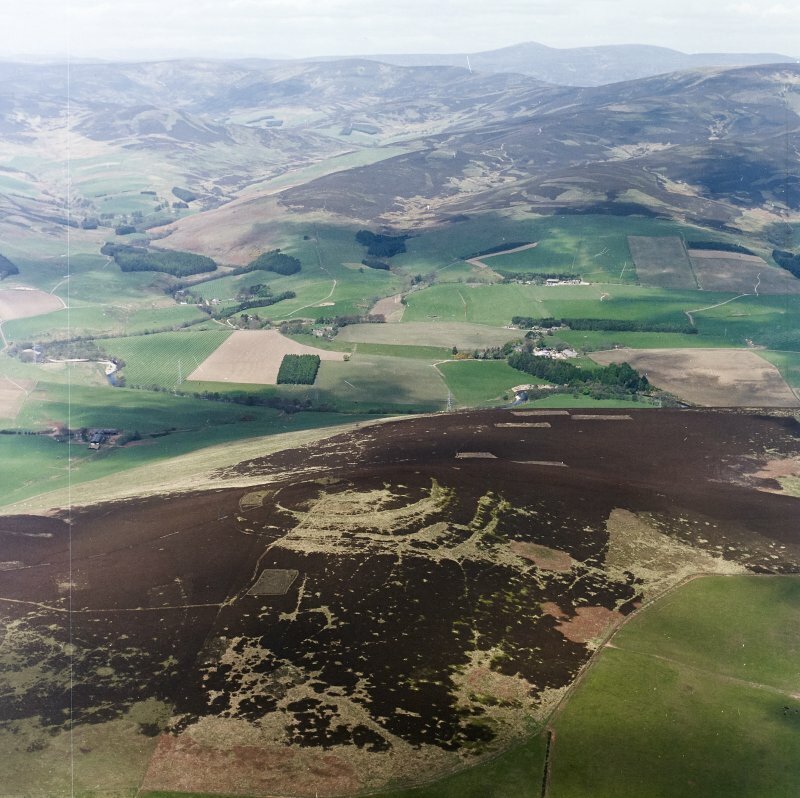 The upper part of the rampart comprises mainly a series of dumped deposits of sandy soil and angular chunks of sandstone, probably derived from redeposited subsoil and bedrock. A rough pebble surface abutted the inner side of the rampart. Trench 3 revealed the rabbit damage to excavated deposits in this entrance passage to be less extensive than from surface traces. 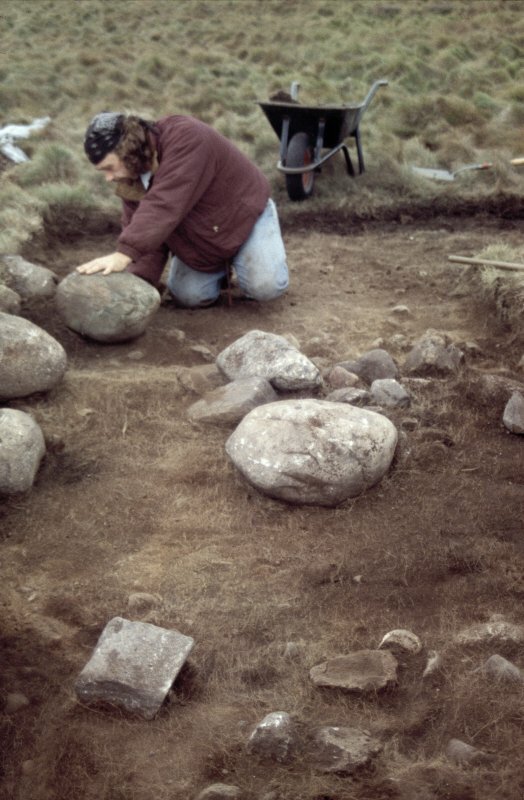 A complex sequence of deposits and stone alignments was identified, but not excavated. 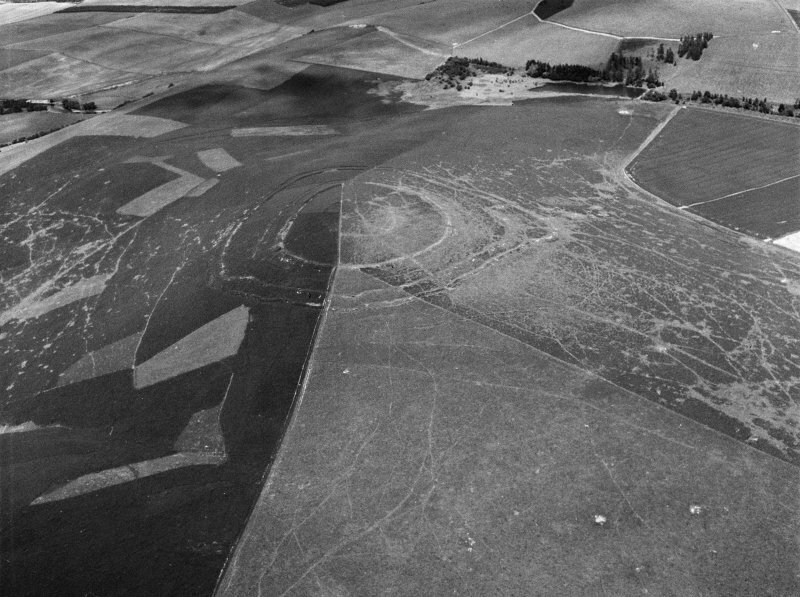 It appeared that the southern boundary of a putative paddock between the outermost two encircling works at this point was a secondary construction to the rampart. Post holes were identified adjacent to the northern rampart terminal which possibly reflect the presence of gateway features. Trench 4 demonstrated that both the outer work and the rampart were of simple dump construction. A single post hole was located on the inturned bank, cut through the rampart deposits. 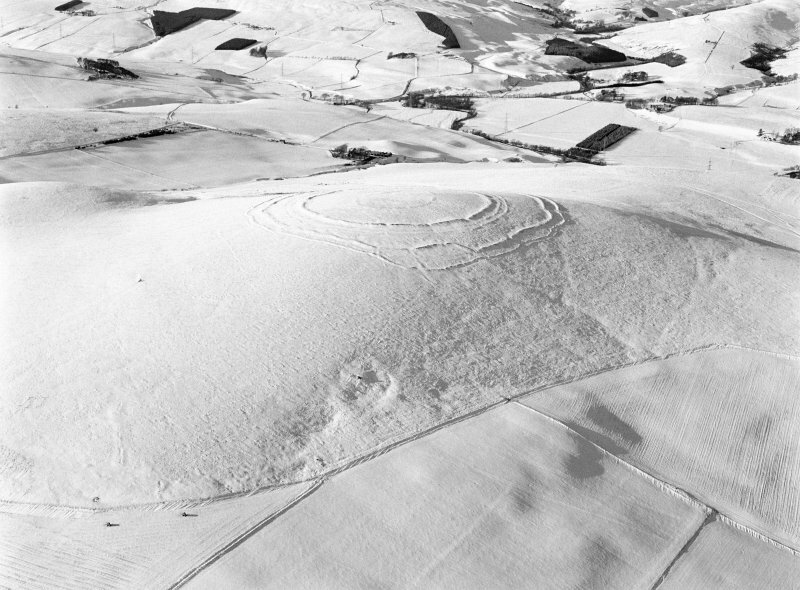 Trench 5 revealed the largest rampart encircling the hill to have a complex construction. 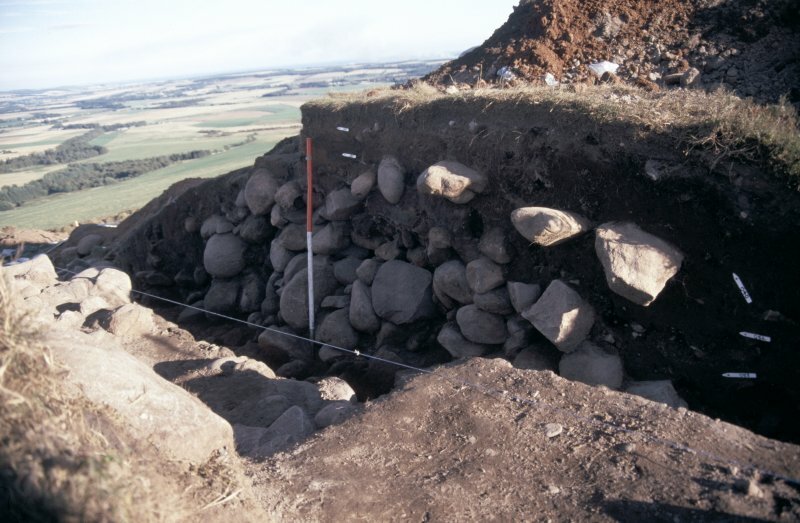 A primary boulder core with an outer revetting face and rubble inner bank was identified. 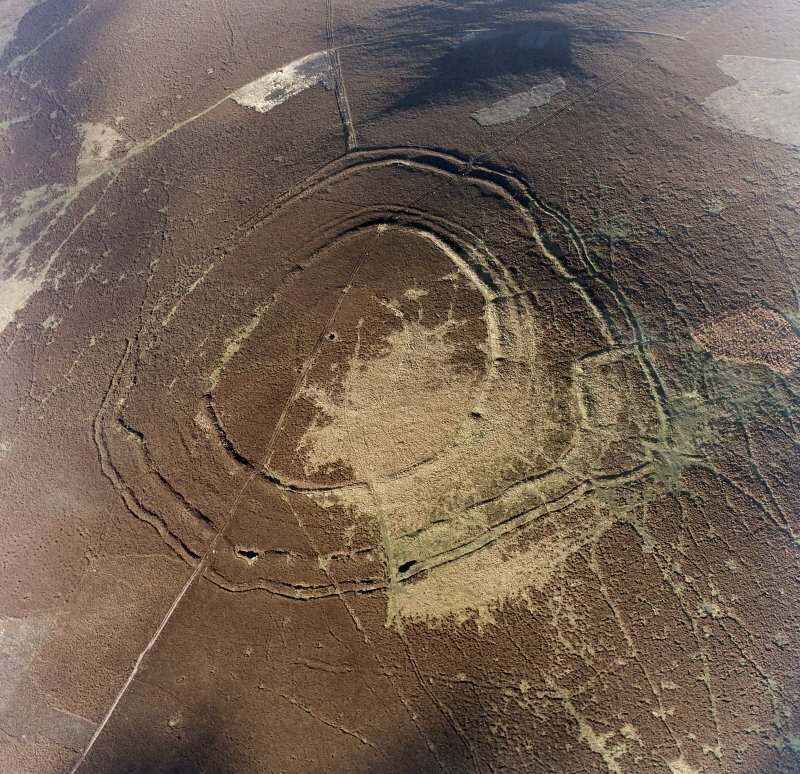 The remains of a hurdle breastwork which had burnt down and collapsed inwards was located on the summit of the capping. This rampart had subsequently been recapped with another turf layer. The ramparts running outside and parallel to this were demonstrated to be no more than low dumps. A palisade trench was identified 3m within the inner of the two, and a post hole sealed beneath a patch of cobbling abutted the outer dump. Trench 6 demonstated the rampart to comprise a low bank of sandy soil containing a number of boulders spread to c3m wide and up to 0.4m high. Sealed or partly beneath the bank were two parallel palisade trenches c1.1m apart running approximately NE-SW and parallel to the bank. The northern palisade trench turned sharply northward within the trench, and possibly defining the position of an entrance. A laid cobble surface lay was sealed beneath a layer of sandy clay soil between the two palisades, above a possible buried turf line. At least two structural phases are proposed and the arrangement of the double palisade feature suggests the presence of a former box rampart with an inturned entrance. Trench 7 revealed a similar sequence. Trench 8 exposed the entrance passage, which was c7.5m long and 2.8m wide. Potential structural features identified within the entrance passage comprise a transverse double cobble alignment enclosing a probable slot, a pebble alignment running perpendicular to this and possibly related, and a negative linear feature with a distinct circular projection. Due to the complexity of features encountered in other trenches and the relatively less serious rabbit damage encountered in this trench little more than cleaning, photography and planning of the deturfed areas was attempted within the time available. 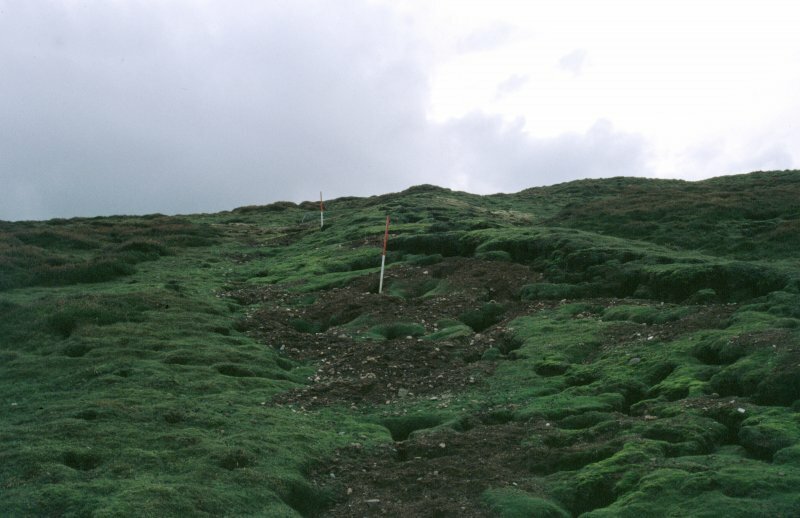 The excavation has shown that the erosion of the archaeological features by rabbit infestation is at least as damaging and in most cases more extensive than surface traces would indicate. A suite of samples was collected and an evaluation of the palaeoenvironmental potential of the site is being conducted. Trenches 1, 2, 5 and 7 produced charcoal deposits which should be identifiable and may be suitable for C14 dating. Finds from the site were limited to two small flint pieces and modern debris. A J Dunwell and R Strachan 1995. Visible on vertical air photographs (OS 68/054/190-1, flown 1968). 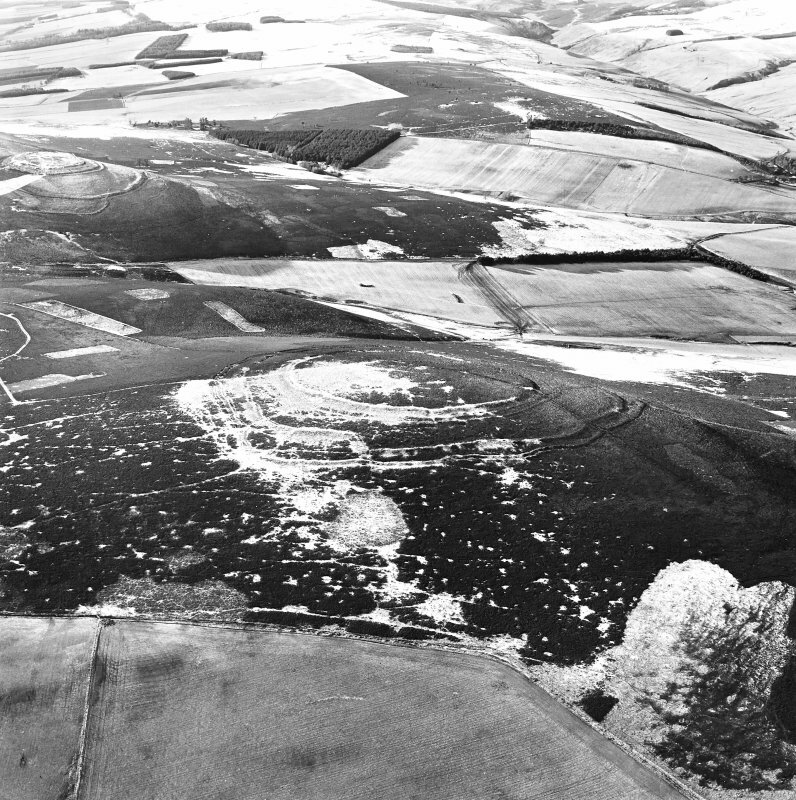 Further rescue and research excavations have been undertaken at Brown Caterthun (NMRS NO56NE 1), a monument in the care of the Secretary of State for Scotland which is suffering severely from the effects of rabbit burrowing (Dunwell and Strachan 1995) for the excavation of Trenches 1-8). Only trenches with results of particular interest are detailed below. 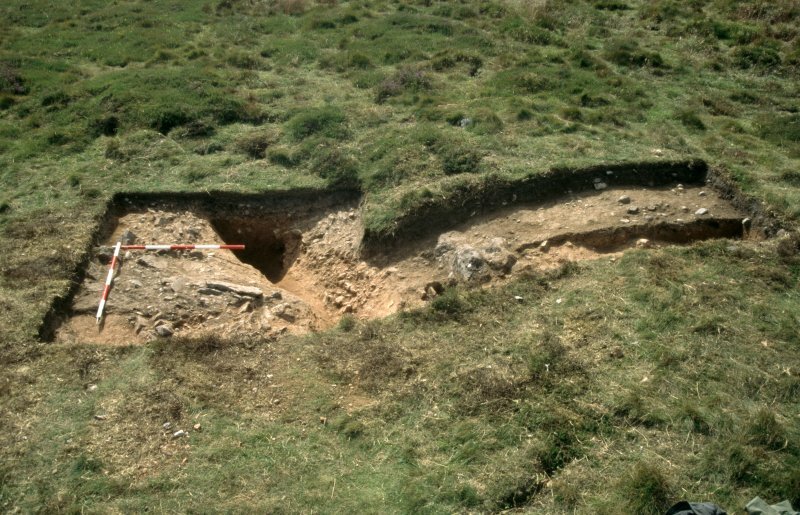 Trench 23 was excavated across a shallow depression on the summit of the hill, generally regarded as the site of a spring. 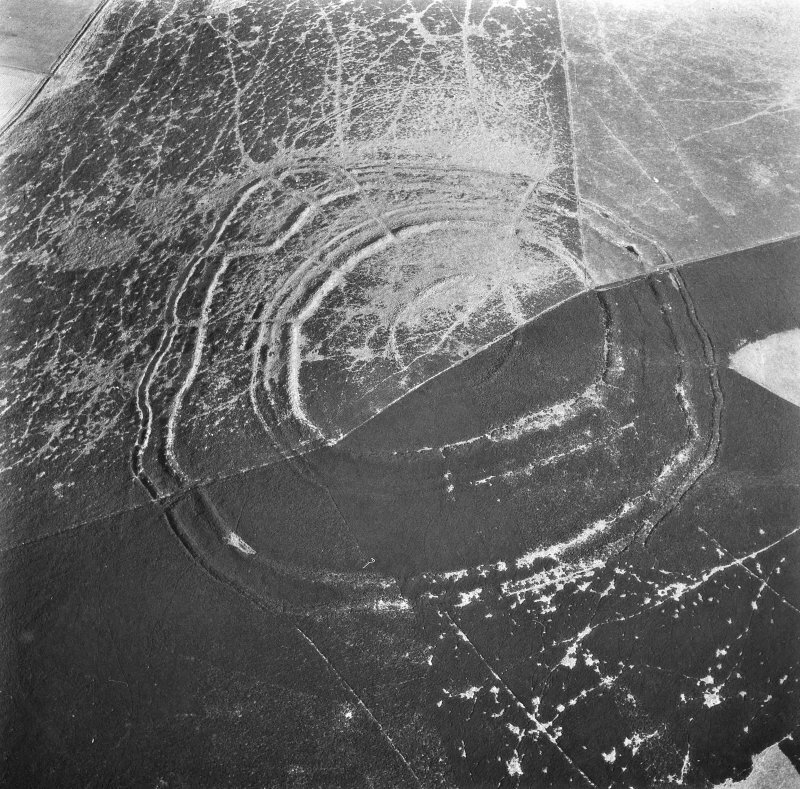 A rock-cut bowl c 3m in diameter by 0.8m deep was revealed; two phases of use were indicated by a recutting of the bowl. The recut feature was filled by a silt rich in burnt grain and charcoal, possibly indicating a function associated with crop processing. Trench 20 was excavated across the S entrance and immediate interior of the inner enclosure, extending Trench 6. 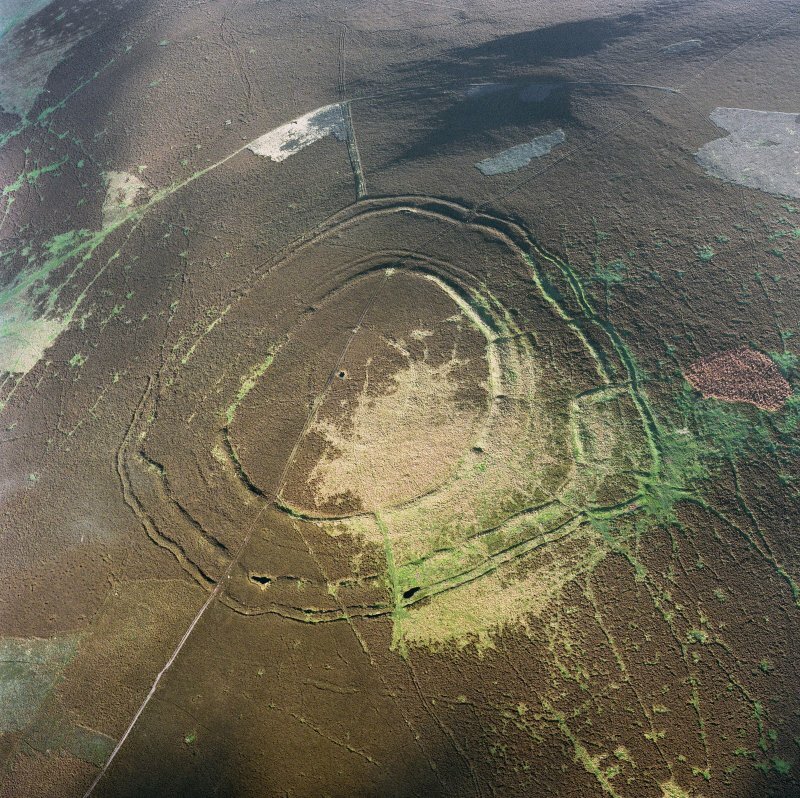 The enclosure was originally defined by a low upcast bank, into which two concentric and parallel palisade slots were cut c 1m apart. These palisade slots defined a gated entrance-way c 2m wide. A primary layer of well-laid cobbling was revealed below the enclosing bank. A spread of rough cobbles was defined within the entrance-way and extended within the enclosure. 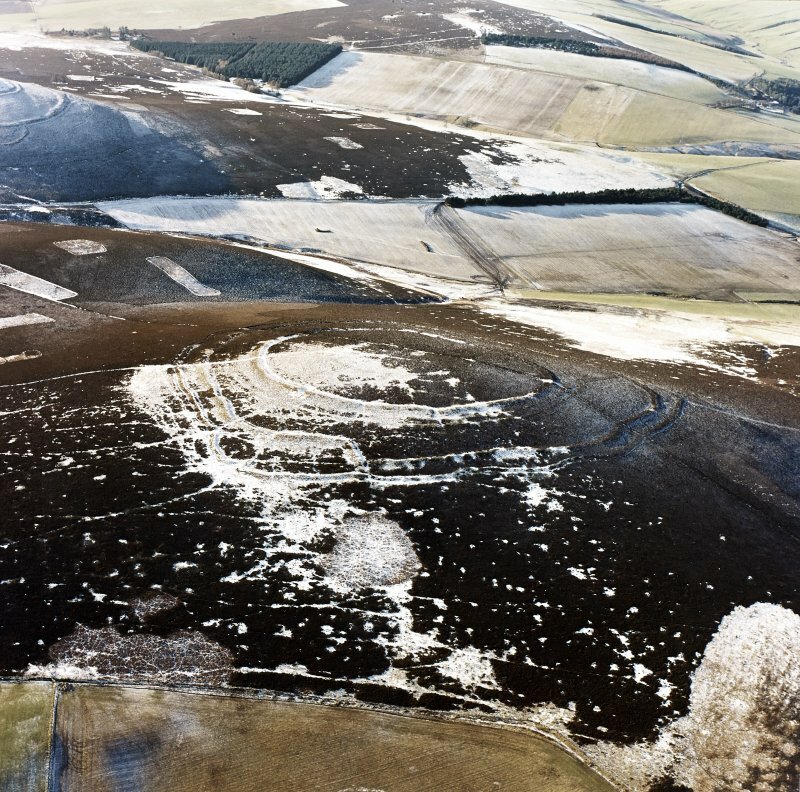 A number of pits, post-holes and lengths of a curvilinear slot identified within the enclosure probably relate to structural remains, but no coherent patterns could be observed. Trench 19 investigated whether the surface indications of a hut platform, one of several on the upper E slopes of the hill, was confirmed by sub-surface remains. 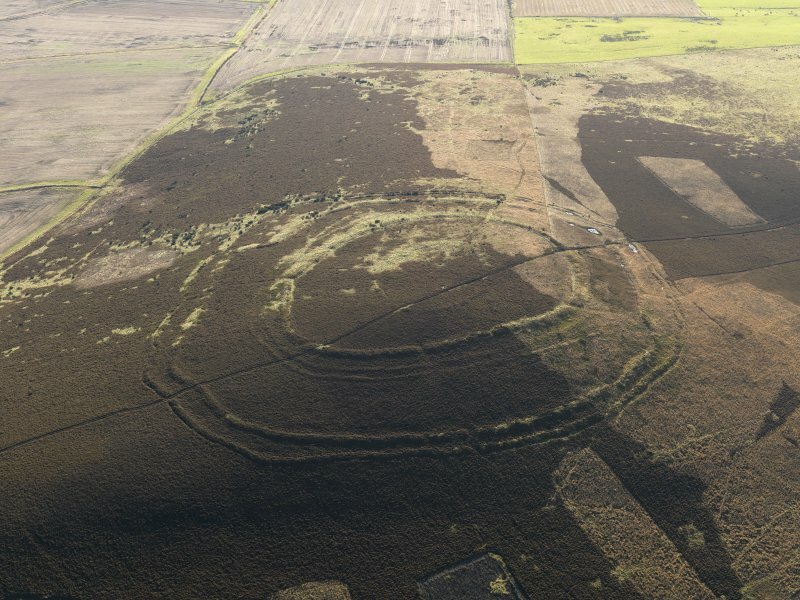 The truncated remains of 11 post-holes and two discontinuous arcs of narrow slots were recorded, which probably represent elements of a timber structure. Hearth waste and pottery were recovered. Trench 17 revealed the largest rampart encircling the hill to be very similar in constructional detail to that identified in Trench 5, comprising a stone wall surmounted by a scorched turf or earth cap. An alignment of four small post-holes ran beside the inside face of the wall. 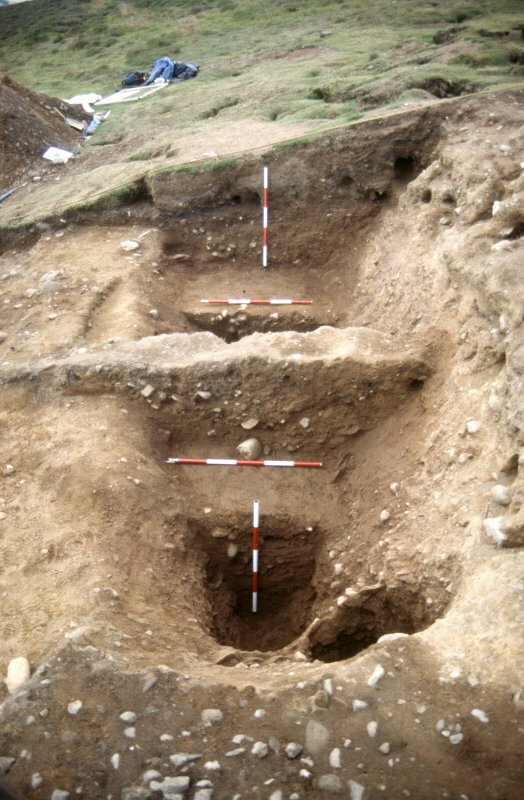 Samples of alder and willow charcoal recovered from the collapsed breastwork in Trench 5 have provided radiocarbon dates (1d) of 488-395 cal BC (GU-4599) and 488-392 cal BC (GU-4600). Trench 16 examined an entrance passage through the largest encircling work, expanding Trench 8. 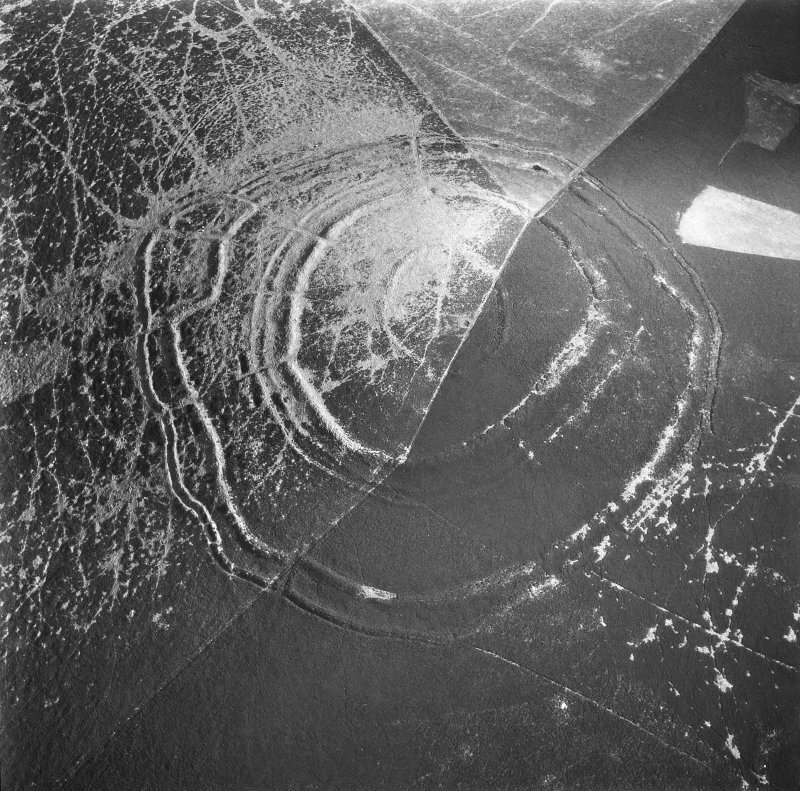 The rampart terminals defining the passage were of similar construction as identified in Trenches 5 and 17. The cobbled entrance passage was c 2.7m wide and was lined by six post-holes arranged in three opposing pairs, the central pair being the largest. Two parallel and intermittent palisade trenches c 3.5m apart approached the entrance from the E (exterior). Parts of these alignments were sealed below the rampart terminals, indicating that the entrance-way had two structural phases. Trench 15 investigated a section of the rampart previously examined in Trench 2, revealing it to be here composed of a series of mixed subsoil dumps and grey, silty, charcoal-rich deposits revetted on the exterior by a boulder face backed by cobbles. A curvilinear alignment of cobbles ran beneath the rampart core, and either represents part of the rampart construction itself or the remains of an earlier structure. Trench 13 extended Trench 3 to investigate the whole of an entrance and adjacent rampart terminals of the second outermost encircling work. 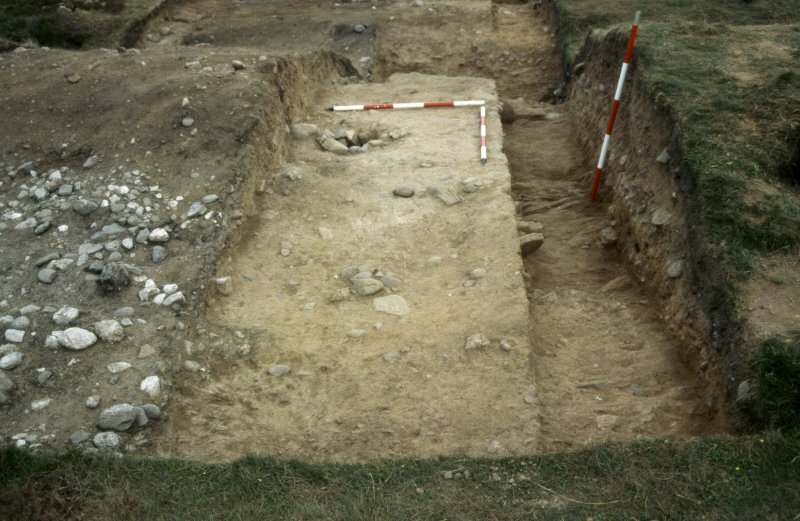 The rampart was of similar form to that revealed in Trench 2, although here two discrete levels of burnt timbers were identified, the lower of branches and the upper of small roundwood. A rock-cut terrace lay immediately outside the rampart, increasing the height of the external face of the rampart. Four rock-cut post-holes defined the position of a gateway. A secondary stone alignment and a low upcast bank defined an avenue leading uphill to the entrance. 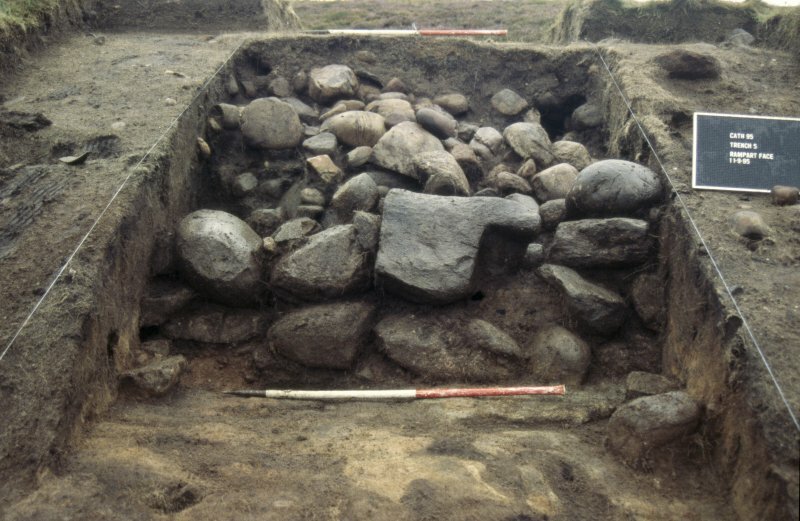 Samples of birch and alder charcoal obtained from the timber layer within the rampart excavated in Trench 2 have provided radiocarbon dates (1d) of 765-408 cal BC (GU-4602), 762-406 cal BC (GU-4603), and 779-515 cal BC (GU-4604). Trench 14 investigated a section of the outermost rampart and rock-cut ditch previously examined in Trench 1. 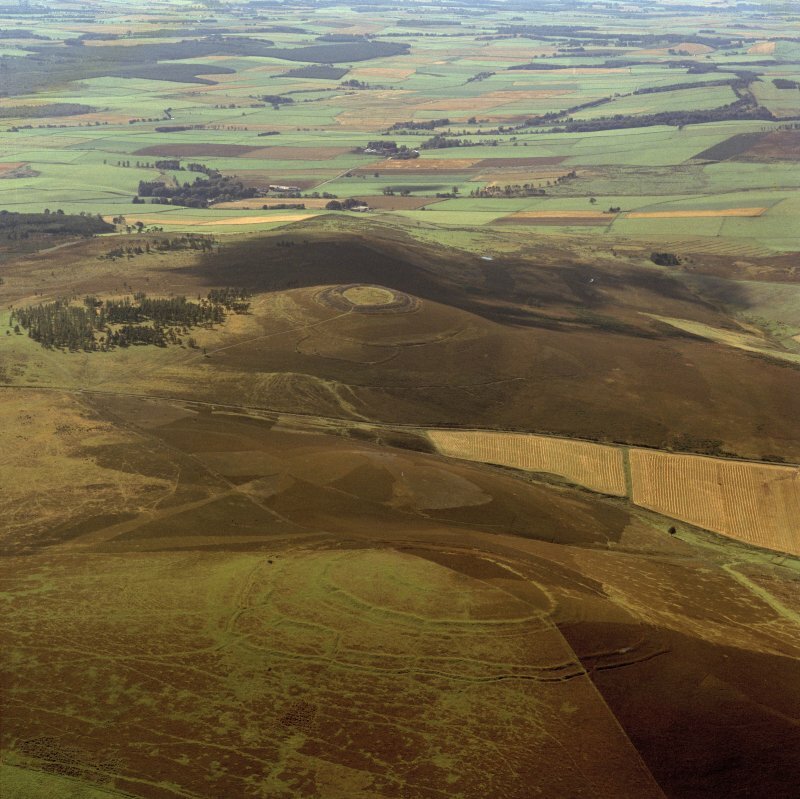 These earthworks were structurally as identified in Trench 1, although there was possible evidence of a recut within the upper ditch fills and of a bedding trench on the crest of the rampart. 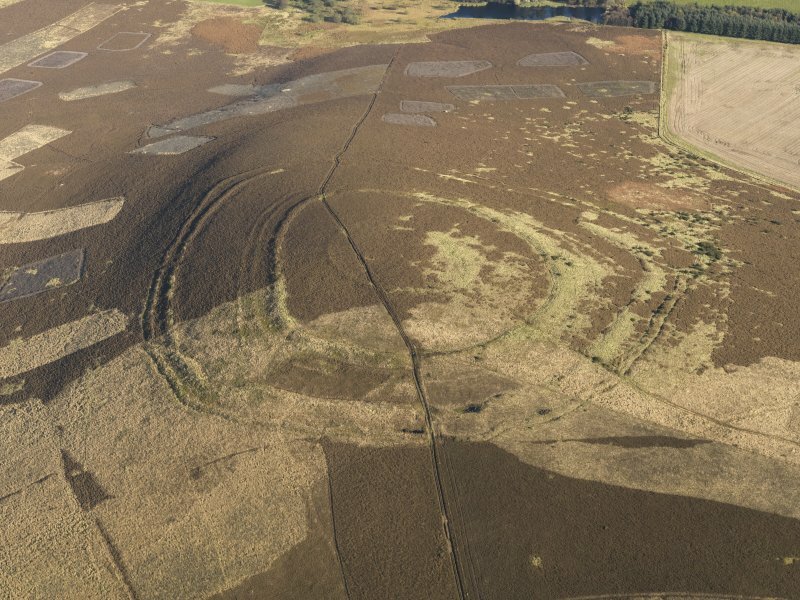 The slight remains of a counterscarp bank and a curvilinear palisade slot were located immediately outside the ditch. This latter may be part of a structure truncated by the rampart and ditch. 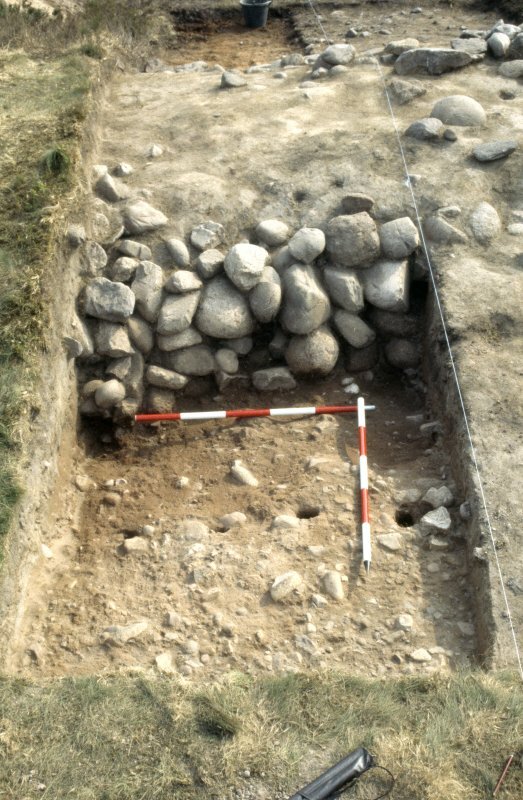 A sample of hazel charcoal obtained from the buried turf layer sealed below the rampart in Trench 1 has provided a radiocarbon date (1d) of 394-207 cal BC (GU-4601). Trench 12 expanded Trench 4 to investigate the whole of the E entrance through the outermost encircling works. 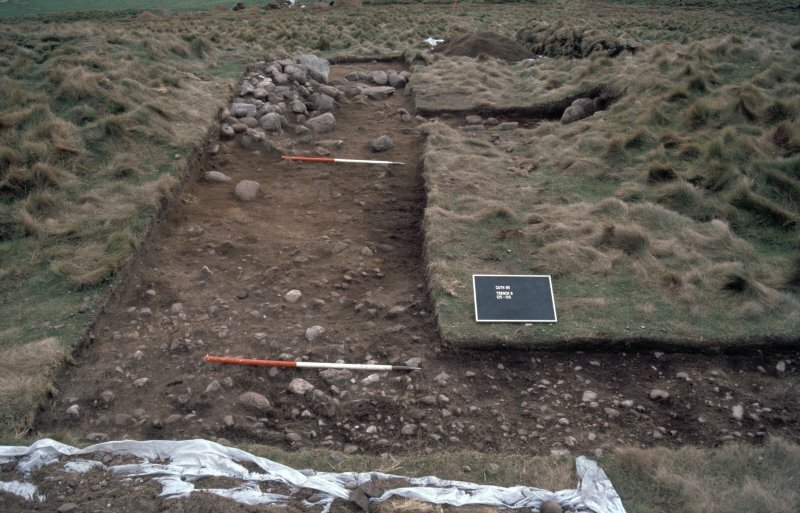 The cobbled entrance passage was revealed to be 2.8m wide, and to contain no certain evidence for a gate structure. The rampart and ditch defining the N side of the entrance inturned markedly, and were abutted by a secondary bank extending uphill towards the Trench 13 entrance. A cobble-filled gully ran between the two ditch termini, probably representing a drainage feature. A Data Structure Report, including details of trenches not reported here, has been produced; a copy is with the NMRS. A J Dunwell and R Strachan 1996. 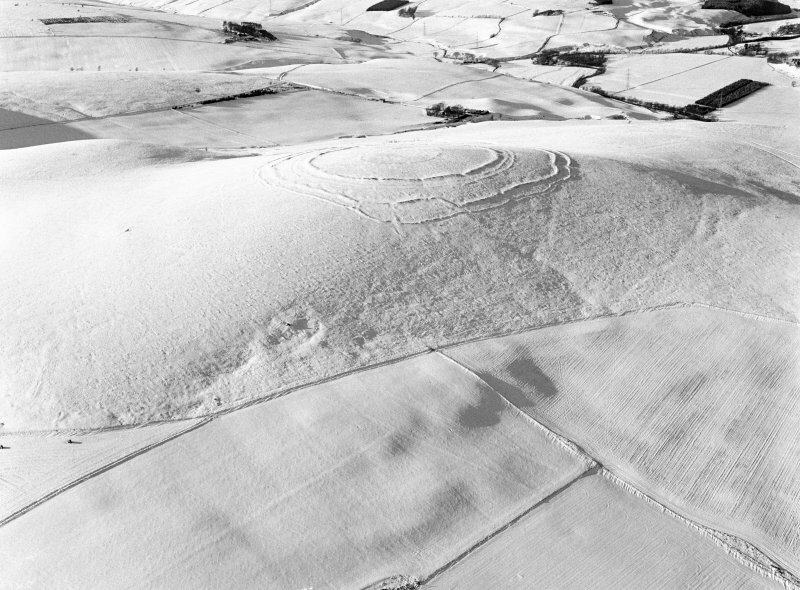 Scheduled with White Caterthun fort (NO56NW 17). 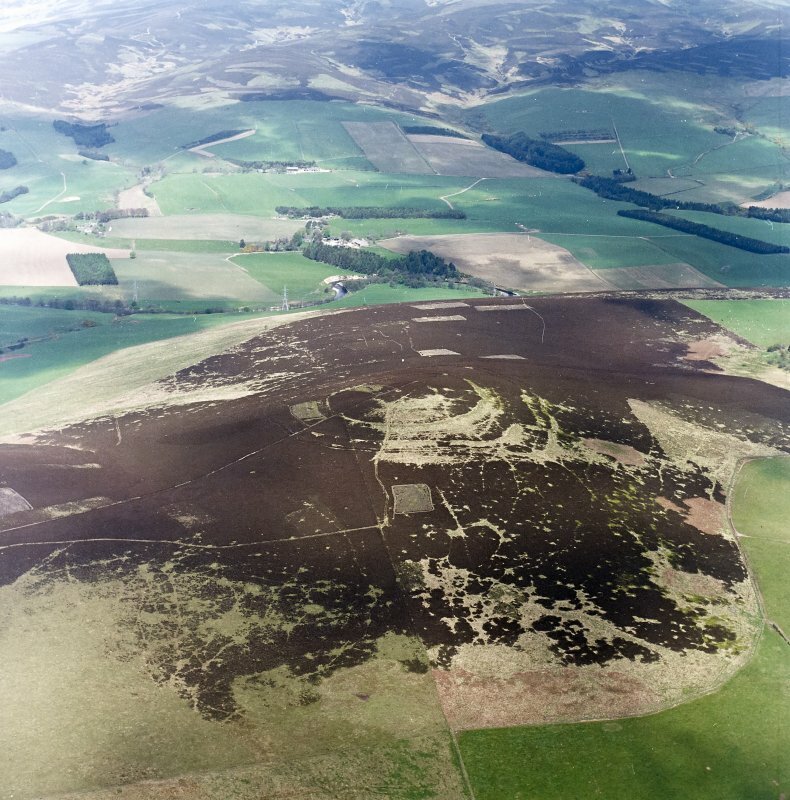 Further rescue and research excavations have been undertaken at Brown Caterthun (NMRS NO 56 NE 1), a monument in the care of the Secretary of State for Scotland which is suffering severely from the effects of rabbit burrowing (Dunwell and Strachan 1995) for the excavation of Trenches 1-8). Only trenches with results of particular interest are detailed below. NO 5550 6673 and NO 5556 6672 Excavations were carried out, 24 March–14 April 2011, on two areas on the monument. The work aimed to determine the extent of any damage caused by fence maintenance work and to recover datable material from the site. 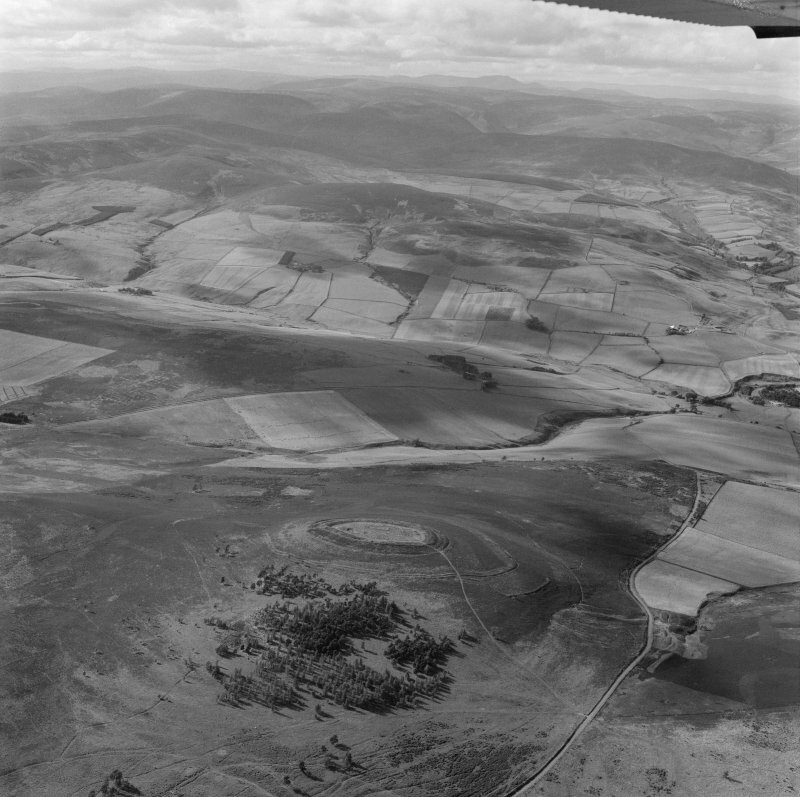 This complex series of fortifications is situated on the Brown Caterthun, the NE of two rounded hills crowned by forts to either side of the saddle carrying the minor public road across the hills to Bridge of Lethnot. 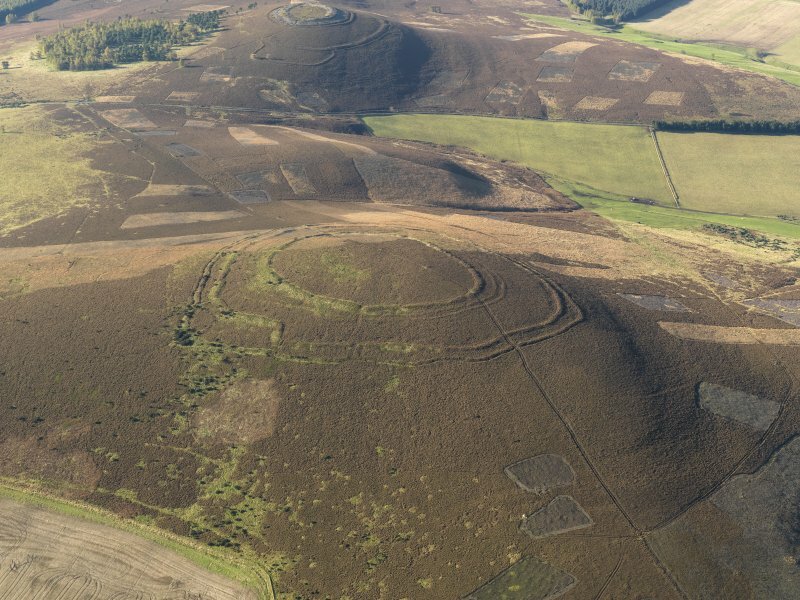 These form a series of enclosures of differing sizes, and though they have been sampled by excavation, which revealed further complexity, the precise sequence of their construction is not fully understood. 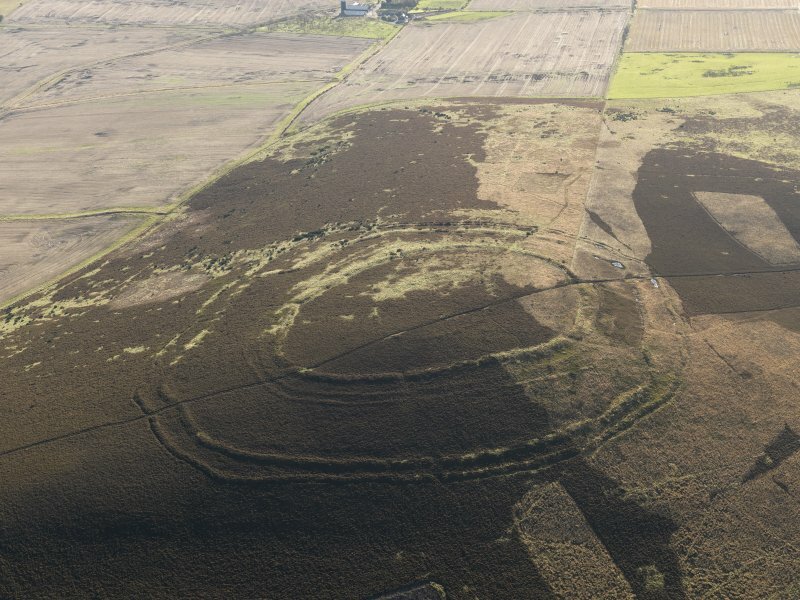 The innermost enclosure, which is probably also the most recent, is oval on plan and measures about 88m from NNW to SSE by 55m transversely (0.28ha) within a low bank; excavation on the S of one of the five entrances through this bank uncovered twin palisade trenches partly beneath its line; the observed relationships at different points between the palisade trenches and the bank were contradictory, but the presence of the packing stones rising in some places into the body of the bank implies that they are either contemporary or the palisades were cut through the bank; A radiocarbon date from the buried ground surface provides a terminus post quem of 360-40 cal BC. 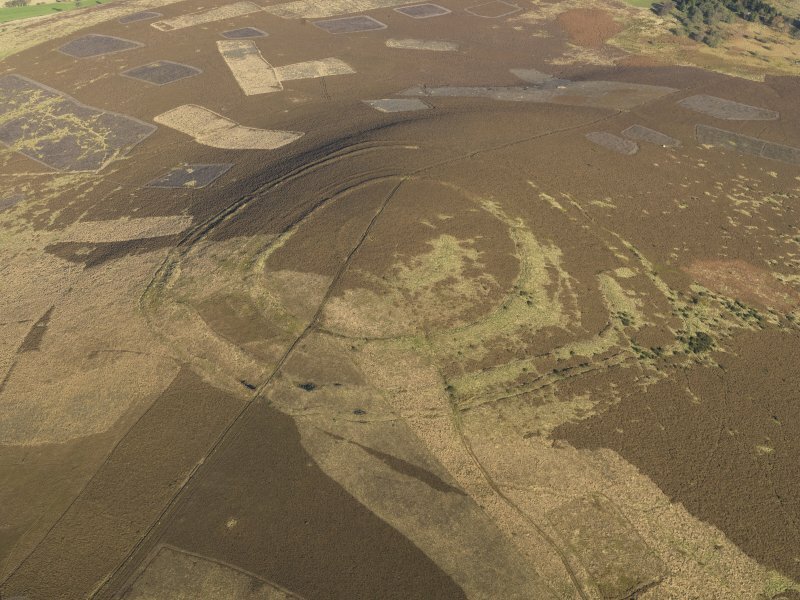 The only features within its interior are a little W of centre a rock-cut pit apparently dating from 800-400BC, and occupying the S end an undated enclosure defined by a shallow ditch 1m broad by 0.3m deep. 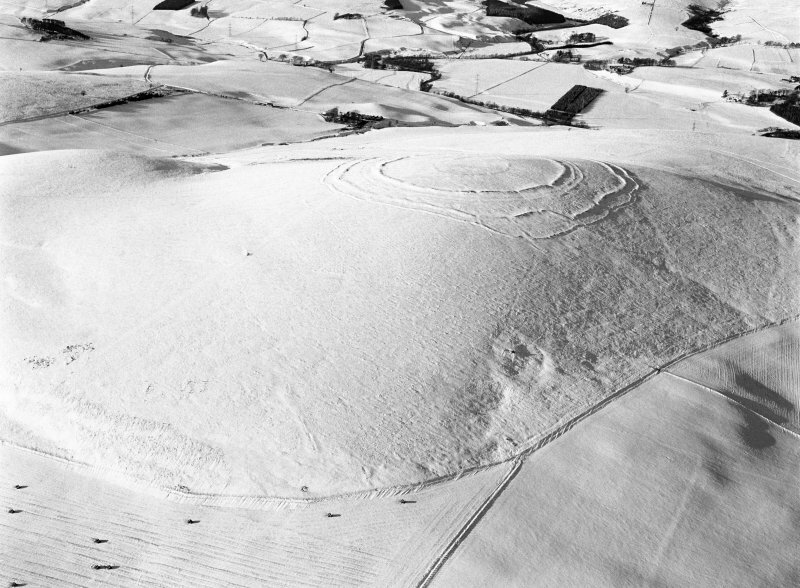 The next line of defences lies eccentrically between 50m and 20m down the slope, comprising a substantial bank about 7m thick by 1.5m high, from which occasional runs of outer face protrude, with two low outer terraces lying concentrically outside it; Internally this enclosure measures about 190m from N to S by 140m transversely (2ha). Excavation revealed a stone foundation over 4m thick in the core of this bank, probably originally with a turf capping, while a palisade trench ran to the rear of the inner of the two outer terraces. One of nine entrances that pierce these defences was excavated on the E, not only revealing two phases of construction, but also a timber-lined entrance passage approaching from the exterior. 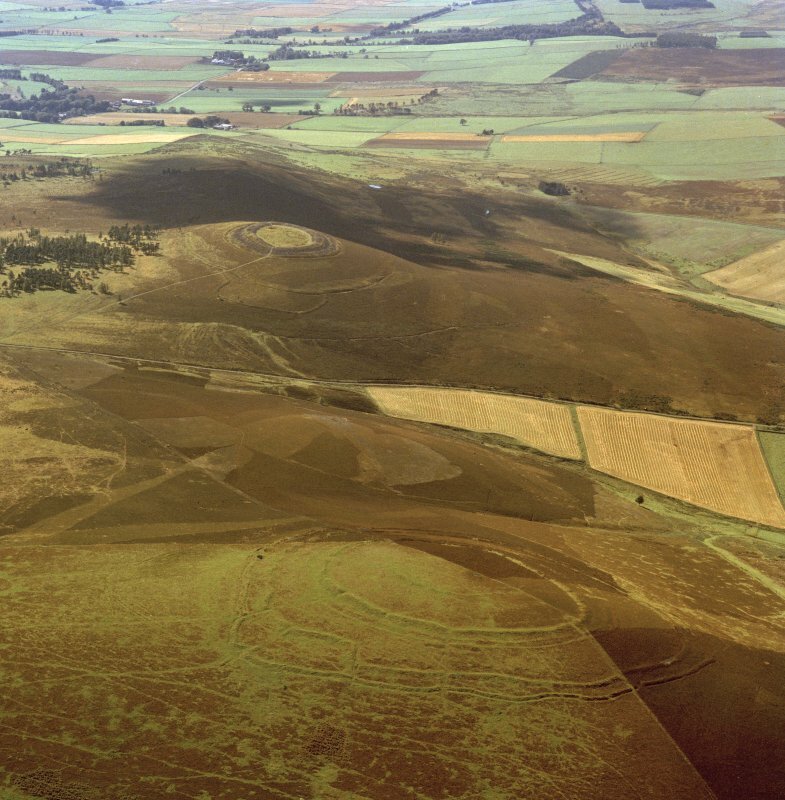 The registration of the gaps through the rampart and those through the outer terraces is relatively close, probably indicating that these defences are closely related, but the axis of the northernmost is curiously dislocated to create an oblique approach that exposes the visitor's left side, while a tenth possible gap in the outer terraces on the SW is blocked by the inner line, raising a possibility that the outer may be of earlier date. The chronology of any of these lines lacks any precision, but they probably date from before 400BC. 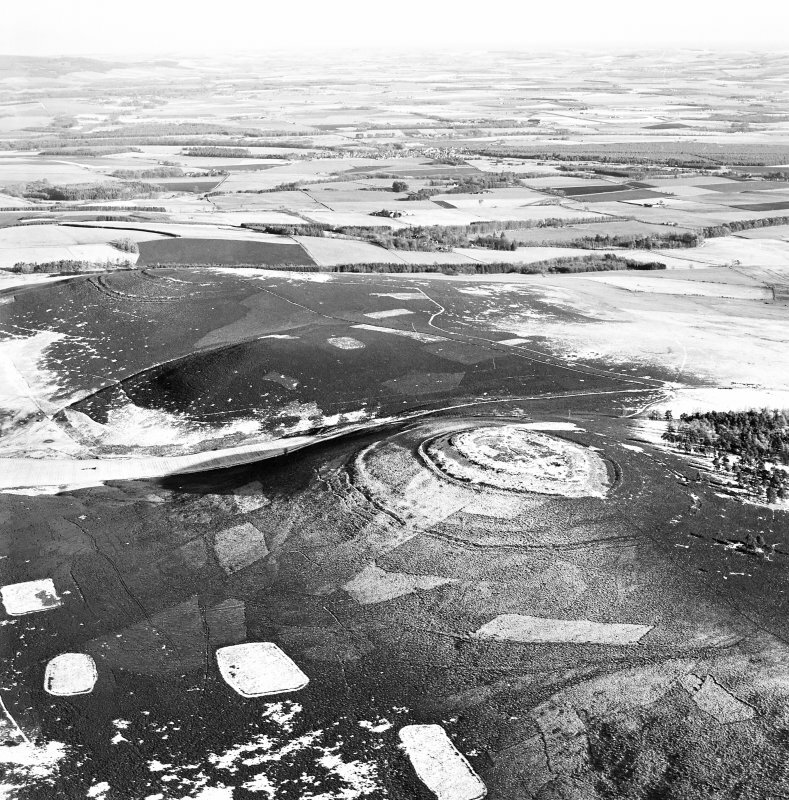 The outermost circuits comprise two ramparts, each accompanied by extensive traces of shallow quarry scoops to their rear, and the outer with an external ditch and a counterscarp bank. These two circuits are pierced by no fewer than nine entrances, of which those on the NE, ESE, SSE, S and NW share axes with entrances through the middle lines; worn hollows can be seen traversing the space between the ramparts and in the case of the four around the SE quadrant the tracks are flanked by low walls or banks. Excavation, however, has shown that while the inner of these two ramparts, which was of composite earth, turf and stone construction and laced with timbers, dates from before 400 BC, charcoal from the old ground surface below the outer returned a date of 410-160 cal BC. 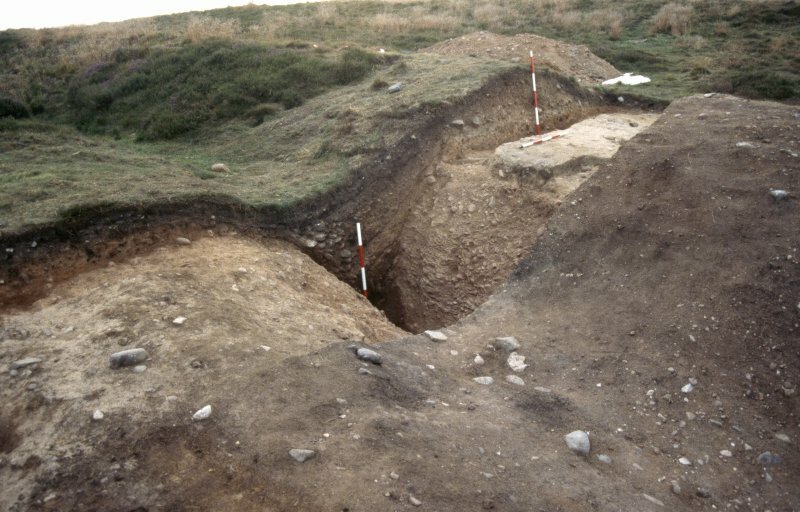 This latter was little more than a dump of quarried material, probably with a turf outer face, and in one place an earlier palisade trench was found beneath the counterscarp bank. 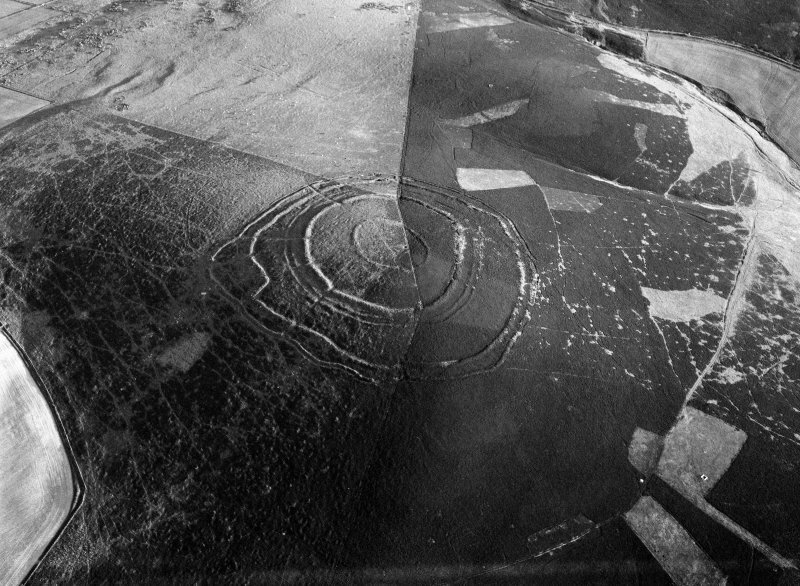 The configuration of these outer defences presents a curious misalignment to create the appearance of an enclosure between the two lines on the E, though to some extent this is now confounded by the radiocarbon chronology. Nevertheless, the outer cannot have operated in isolation, and the banks flanking entrances and running back to gaps in the inner imply that at the time of its construction the two were conceived in unison. This is an indication that there are further complications to be unravelled in the structure of the inner, particularly as one of the five radiocarbon dates from the timberwork in its core is directly contemporary with the one from beneath the outer. 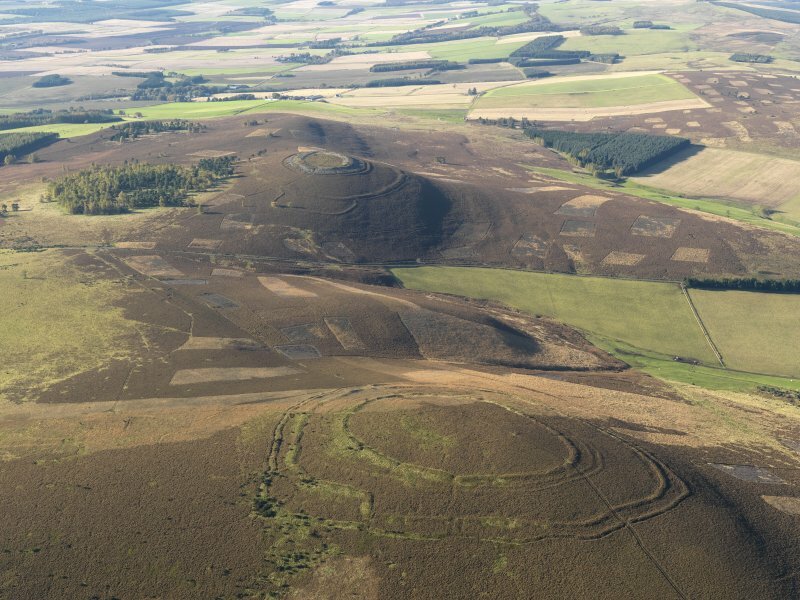 With the exception of what may be an unfinished line of defence, which can be seen contouring around the SE spur, these represent the most extensive enclosure on the hill, taking in an area of some 5.5ha; the projection of the unfinished line, however, takes in 8.88ha.